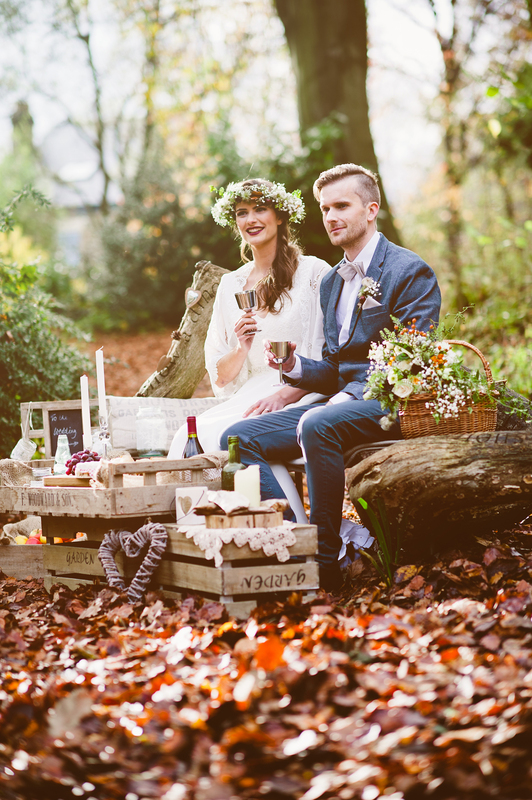 We’ve spoken before on the blog about our love for autumn, and so when this dreamy styled shoot inspired by the season fell into our inbox, we just knew we had to share it you, our lovely readers. 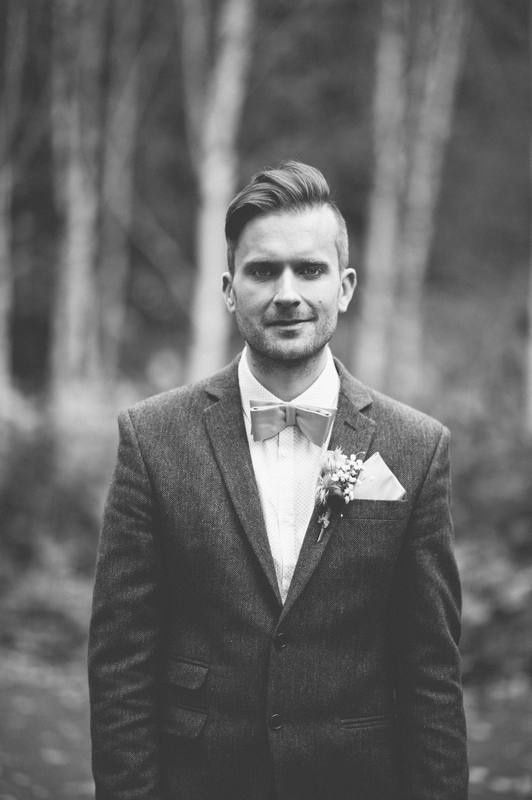 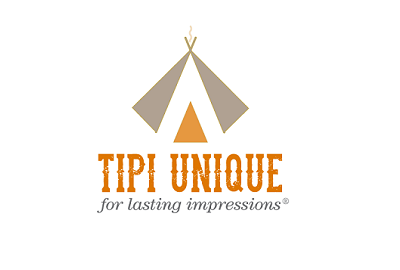 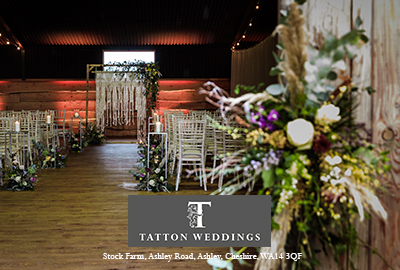 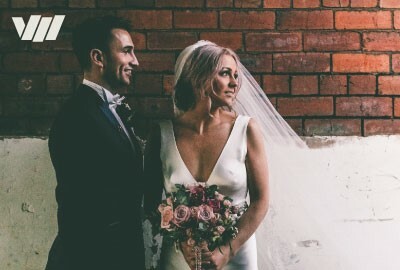 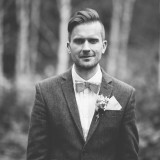 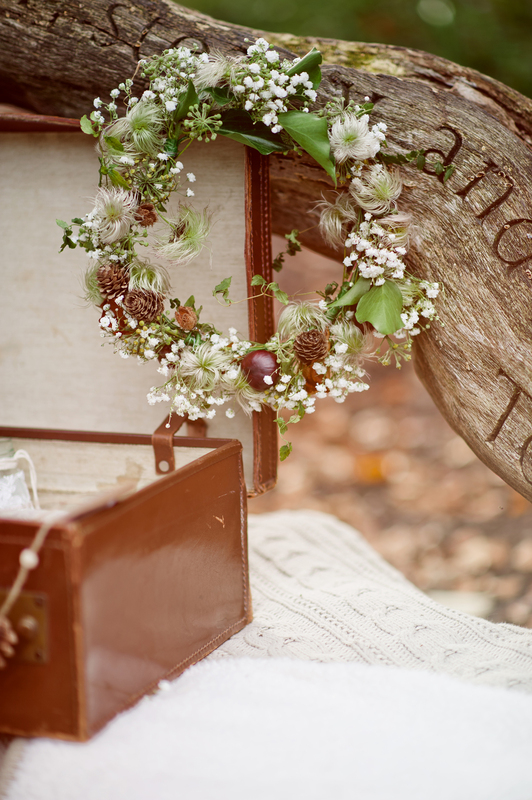 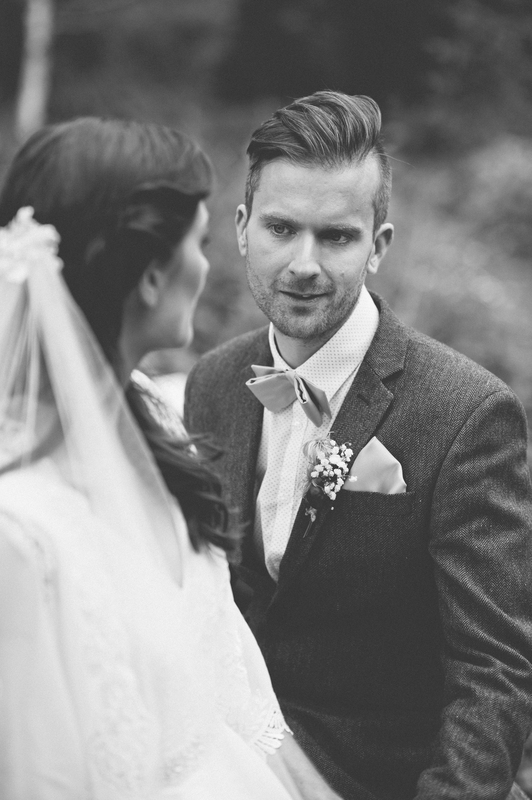 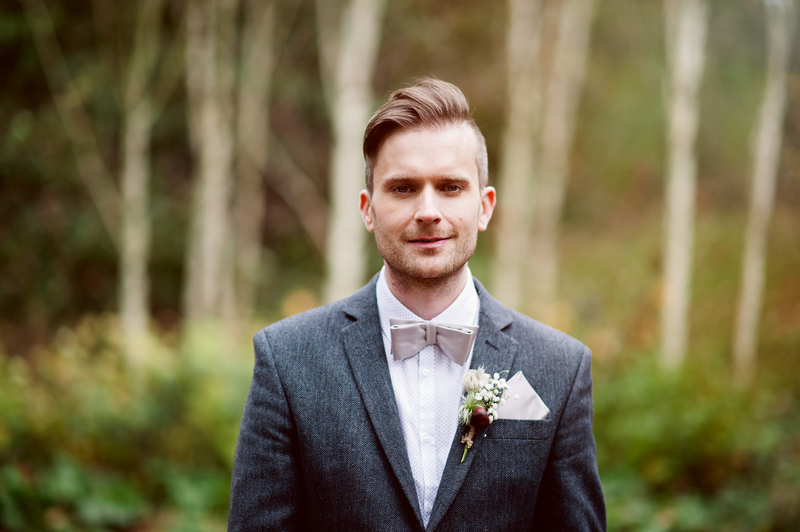 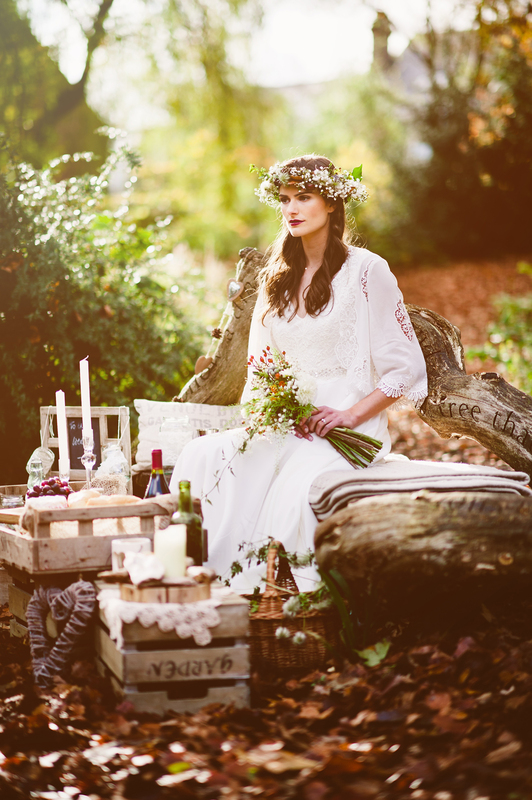 Put together by a very talented bunch of Sheffield wedding suppliers at the city’s Botanical Gardens, the theme and concept behind the images was simply to inspire brides who would like a rustic bohemian themed wedding. 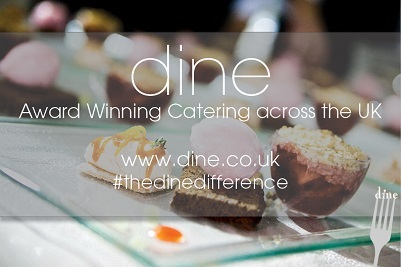 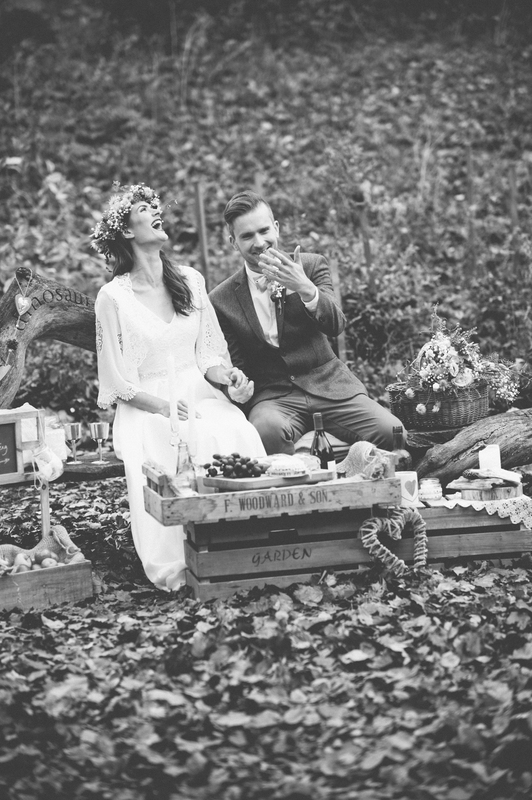 Having been totally captivated by the images below we’d say they’ve easily achieved their goal. 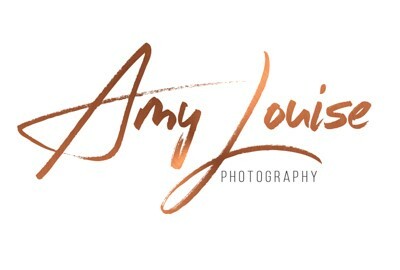 With images by Key Reflections. kelly says: Inspiration for the bohemian themed shoot came from the warm autumnal colours within the beautiful Botanical Gardens in Sheffield. 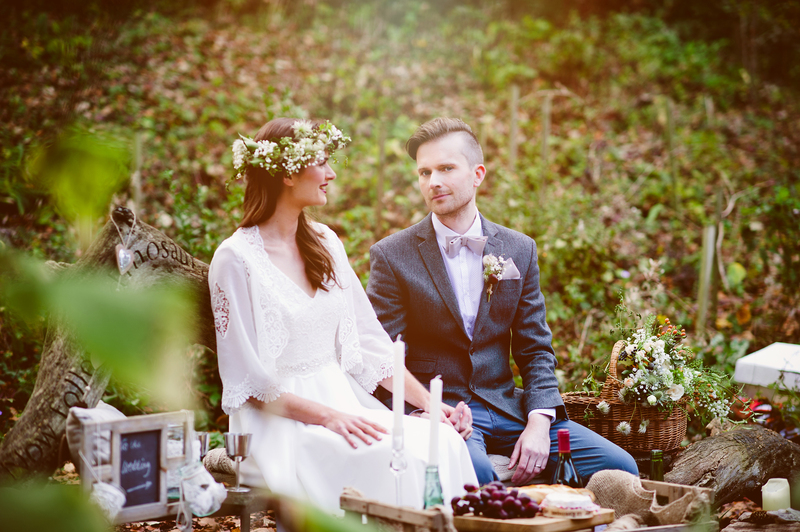 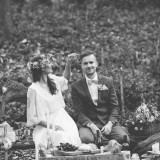 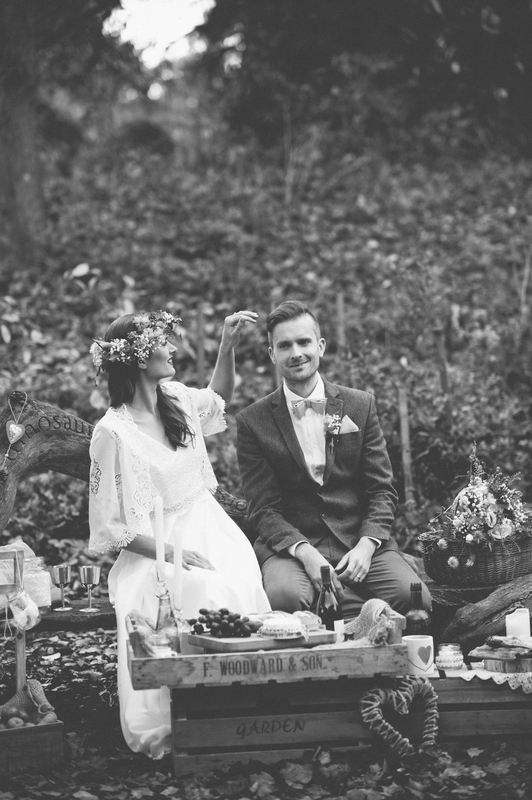 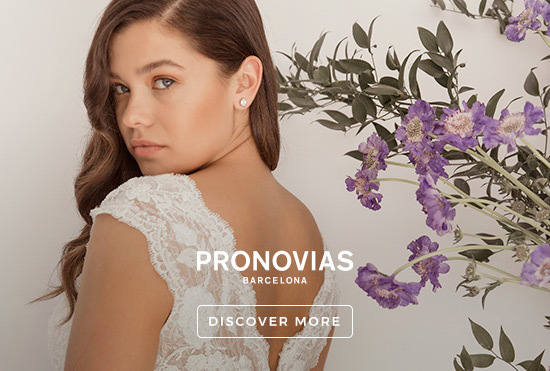 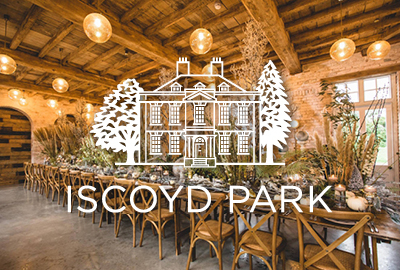 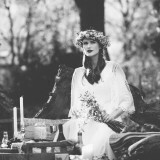 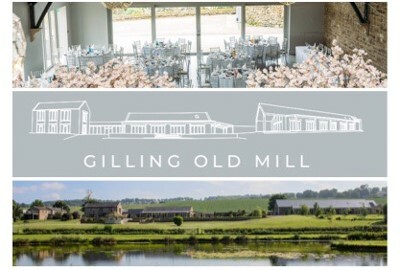 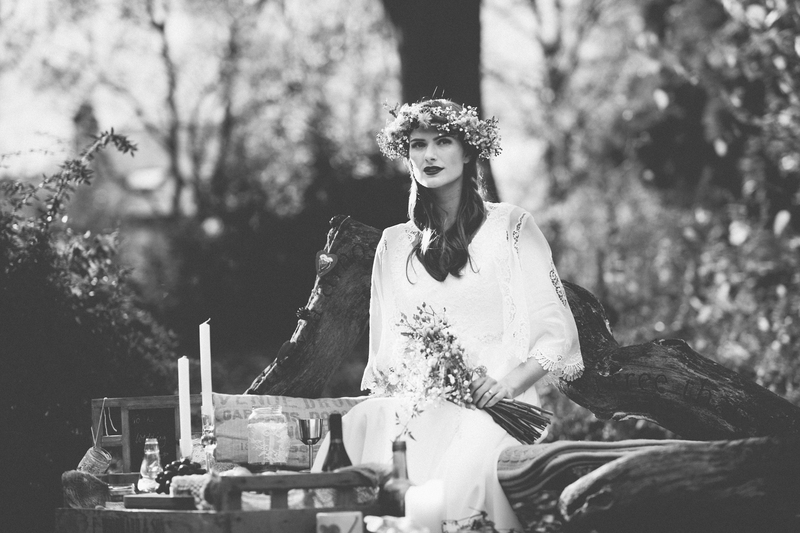 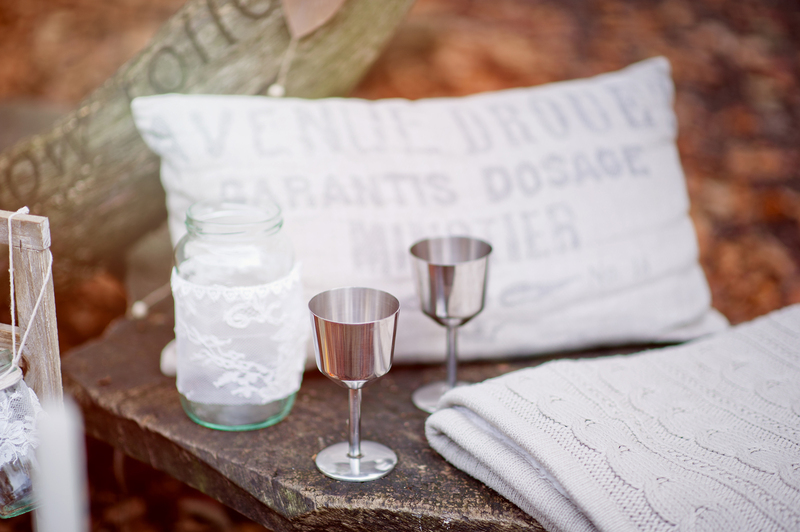 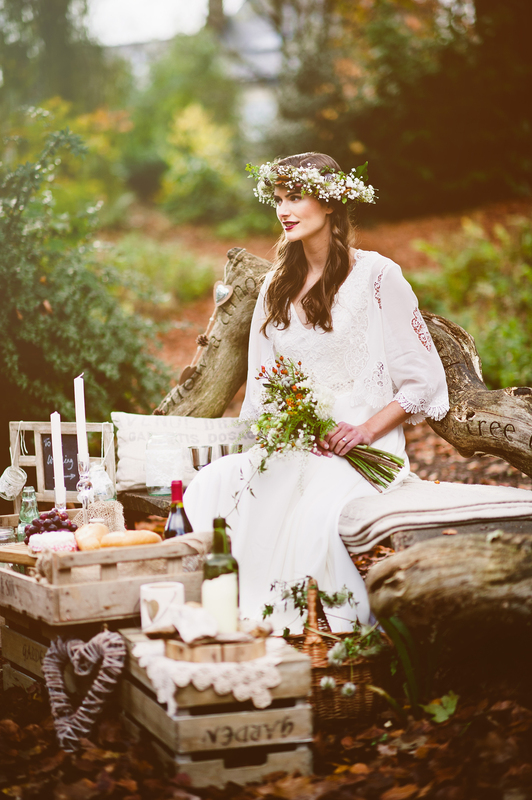 We created two looks to provide inspiration for brides who desire a rustic bohemian themed wedding by shooting within the woods to create a ‘rustic picnic’ and shooting within the beautiful conservatories and gardens to give a true ‘bohemian’ feel. 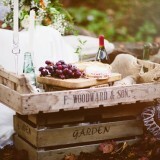 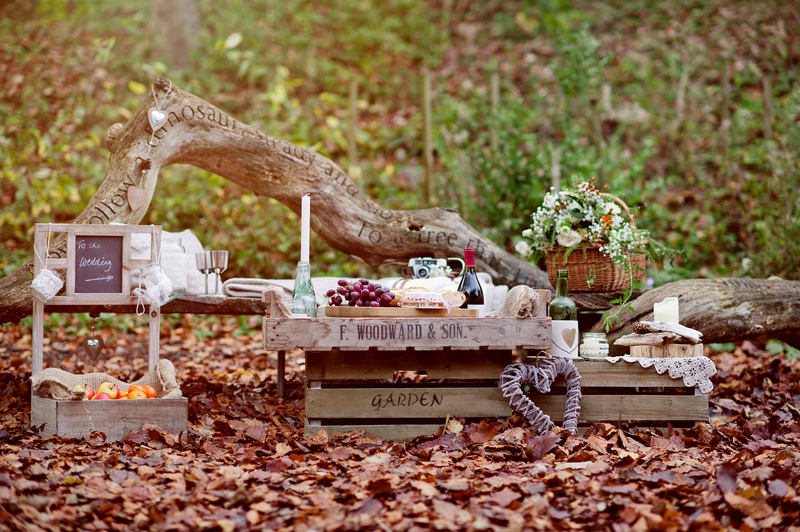 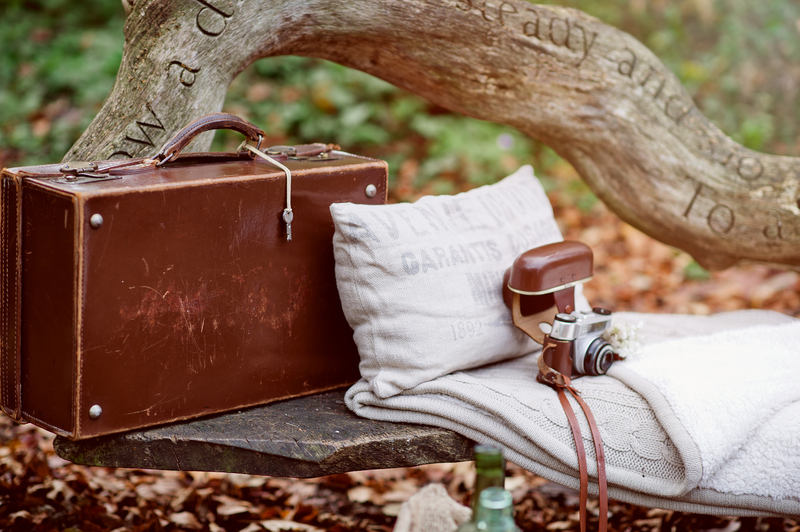 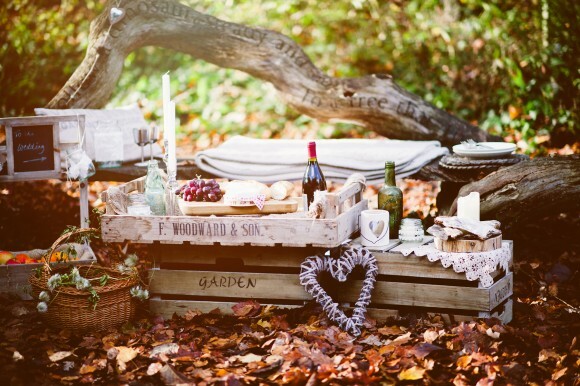 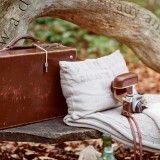 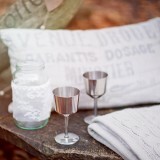 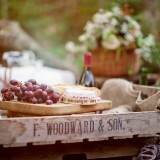 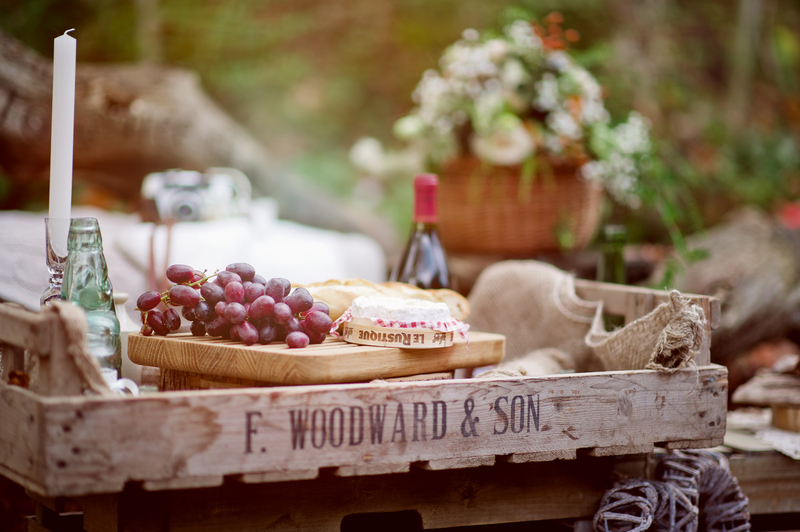 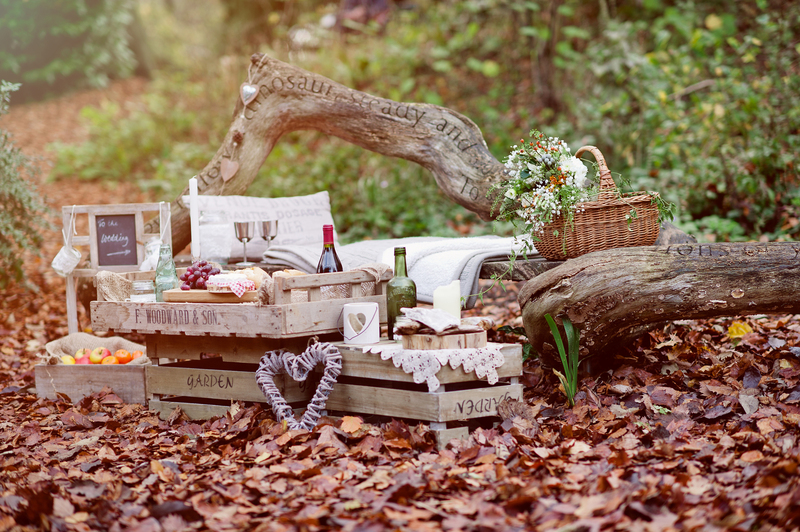 For the picnic setting, set stylist Julia Jeckell, created a rustic feel using old wooden crates for the picnic table and old canvas sacks and cushions for seating. 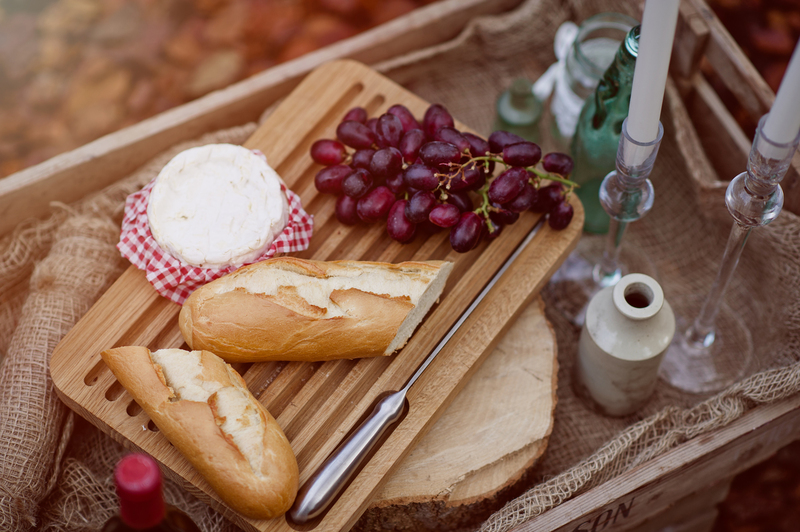 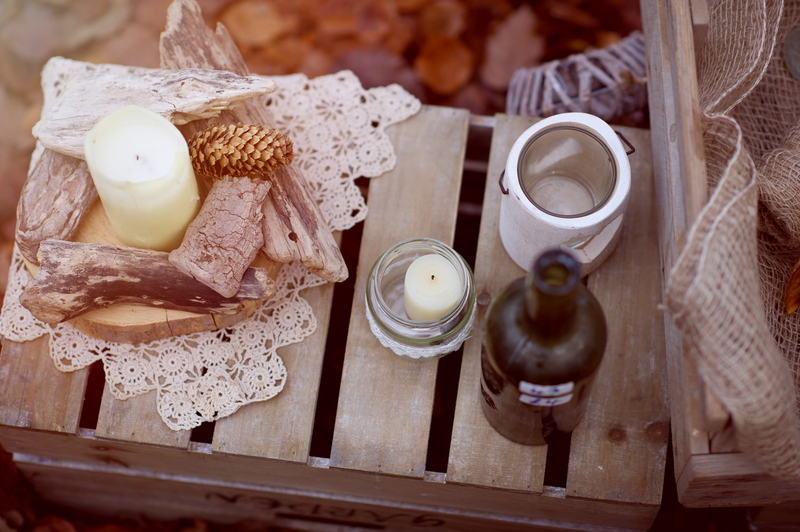 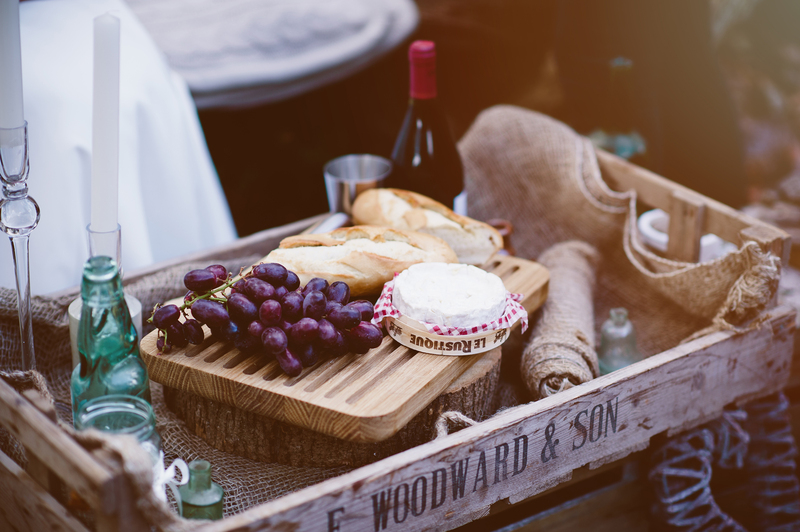 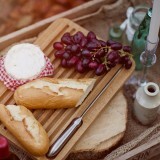 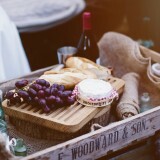 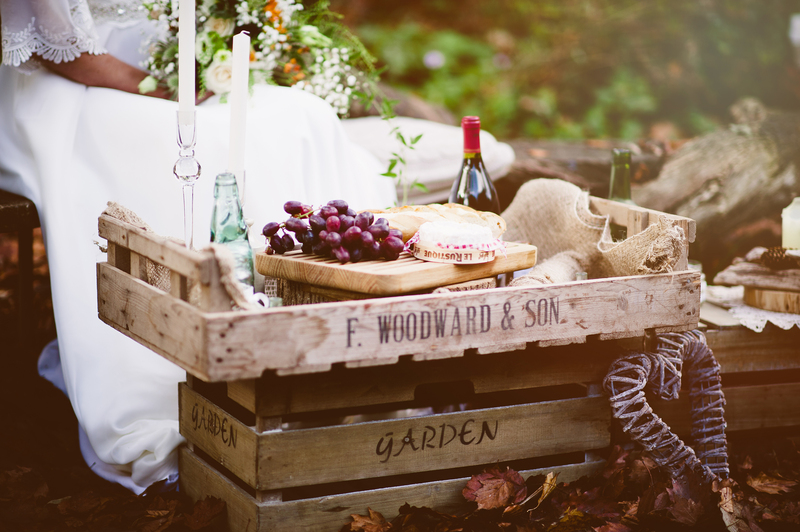 The picnic table was styled with a delicious selection of outdoor picnic food – fresh French bread and cheese, red wine and autumnal fruits in shades of burnt oranges and reds. 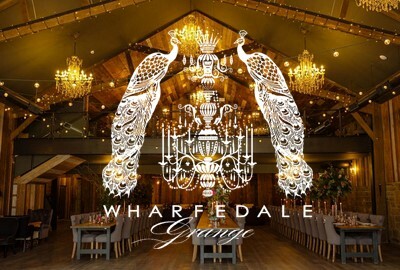 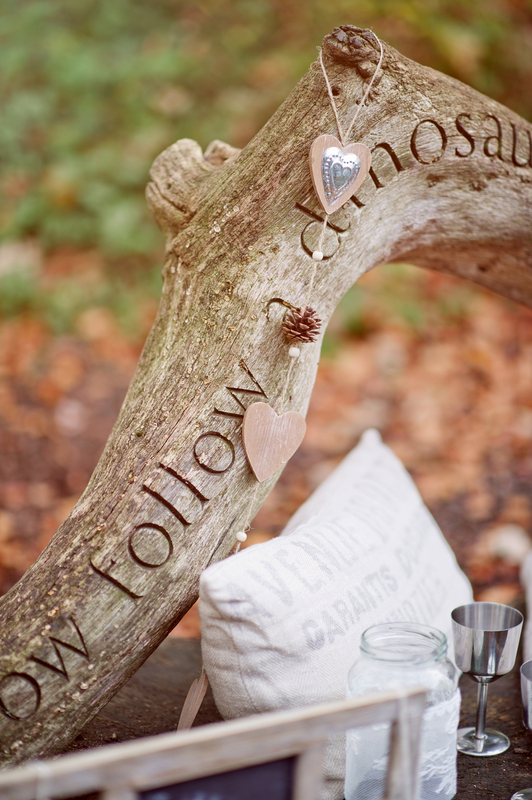 The finishing touches were made with candles in old jam jars, pine cones, rustic hearts, and props in reclaimed materials all sourced in Sheffield. 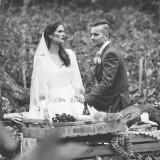 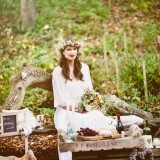 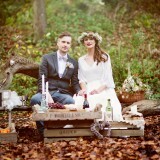 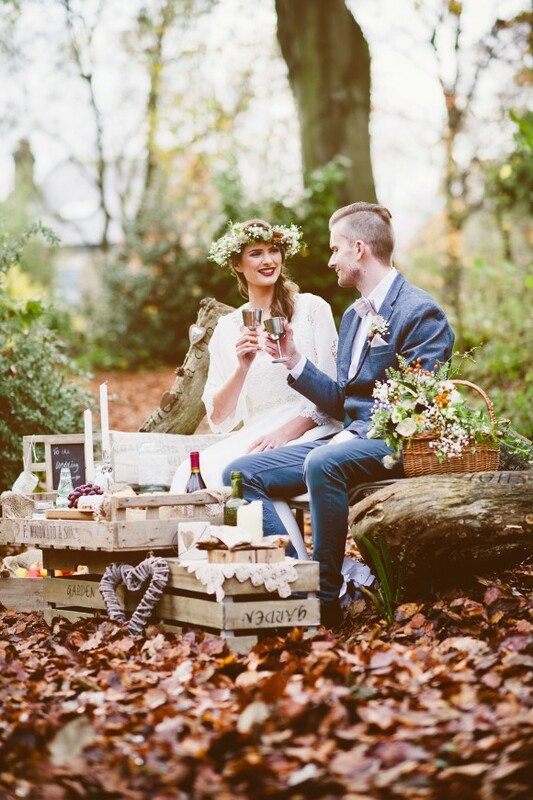 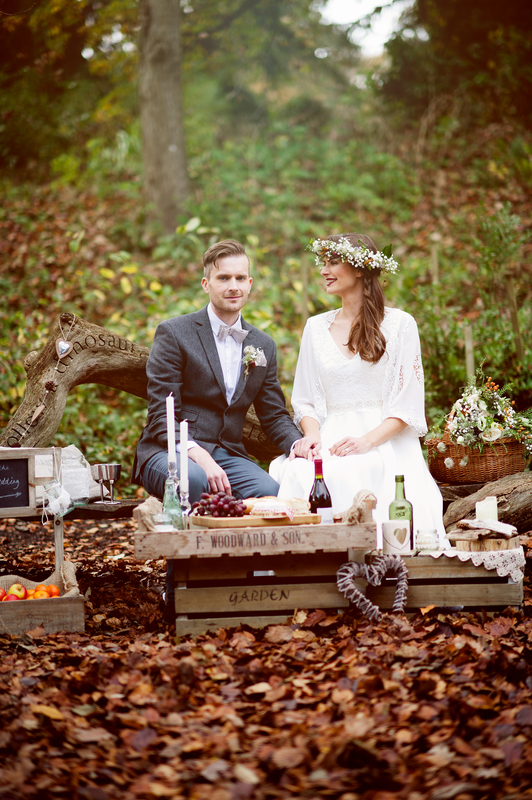 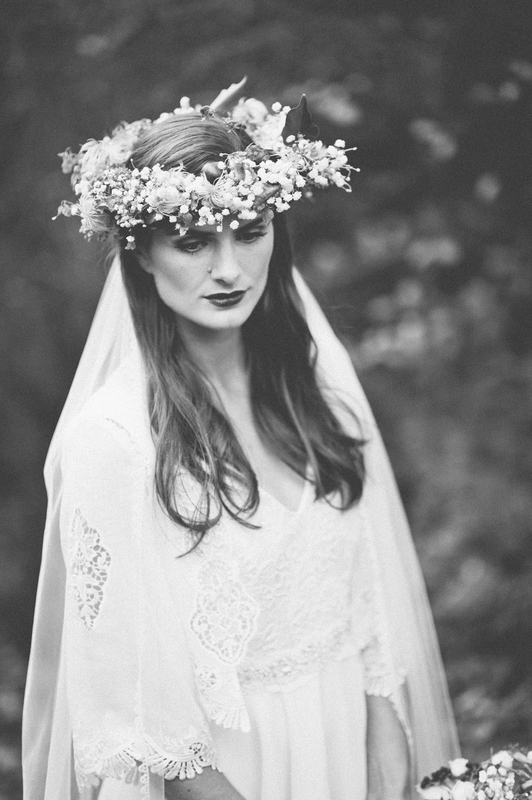 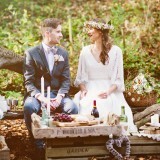 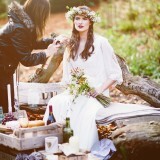 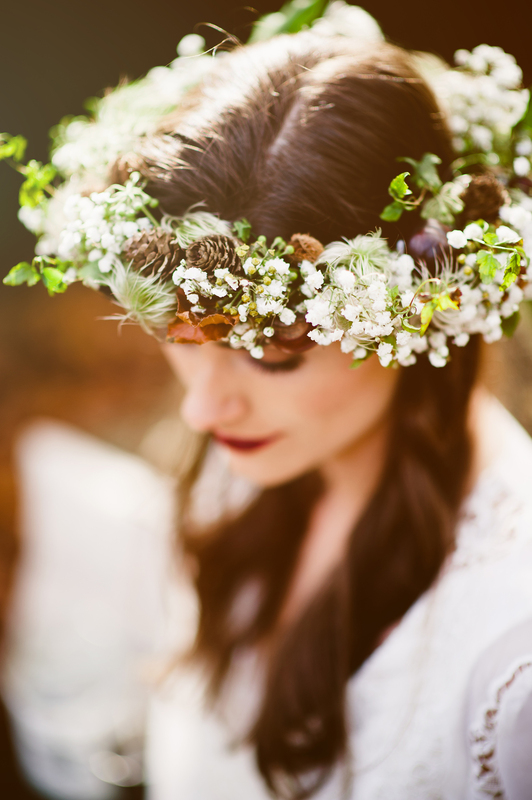 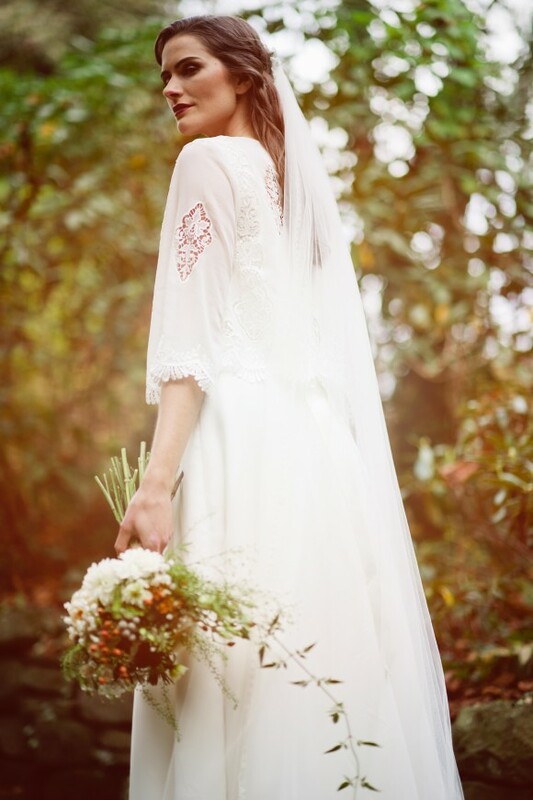 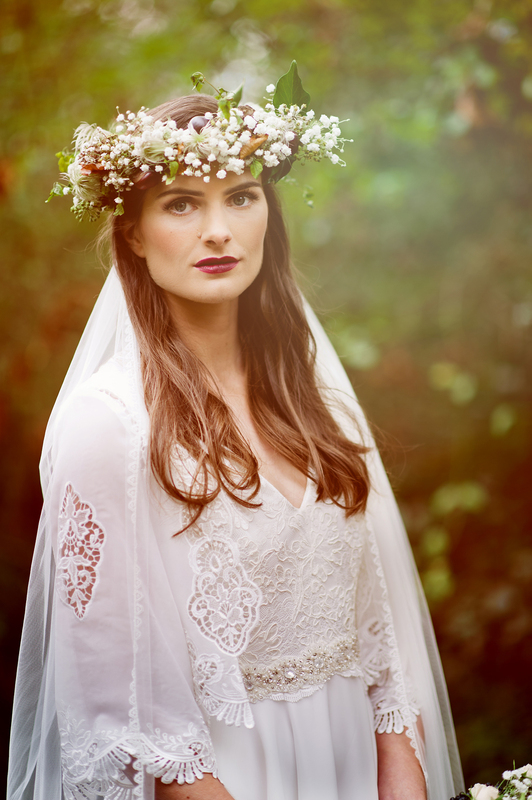 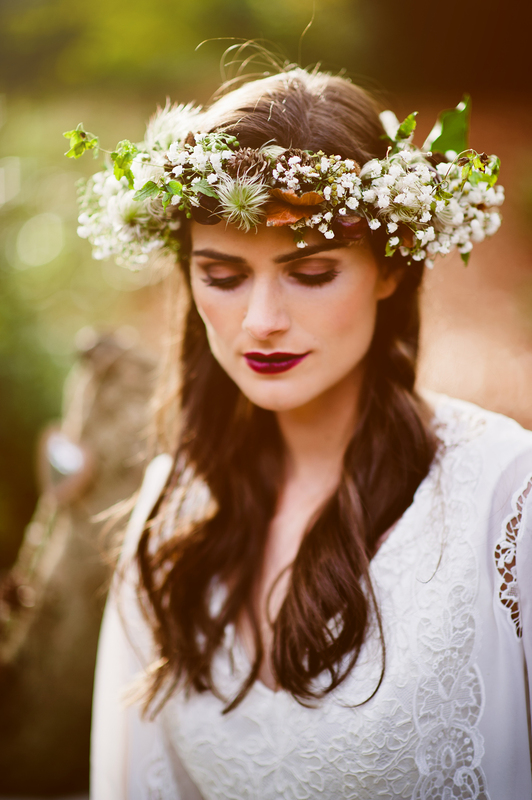 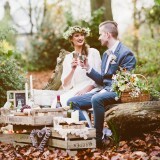 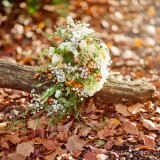 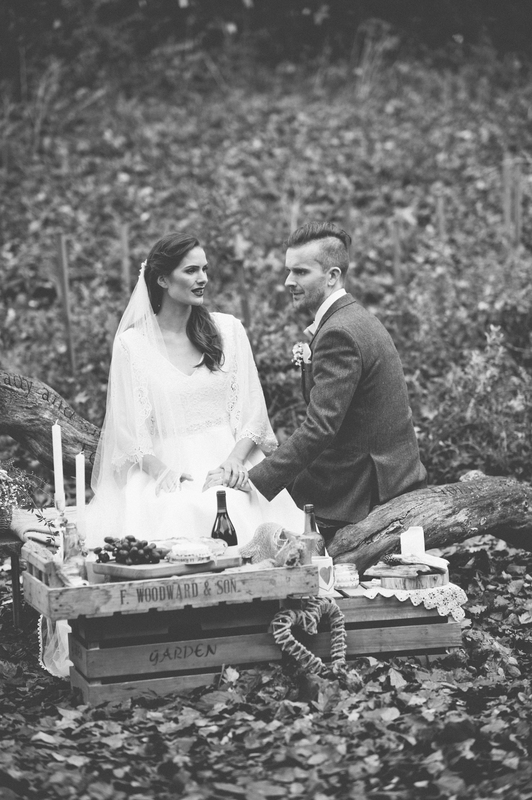 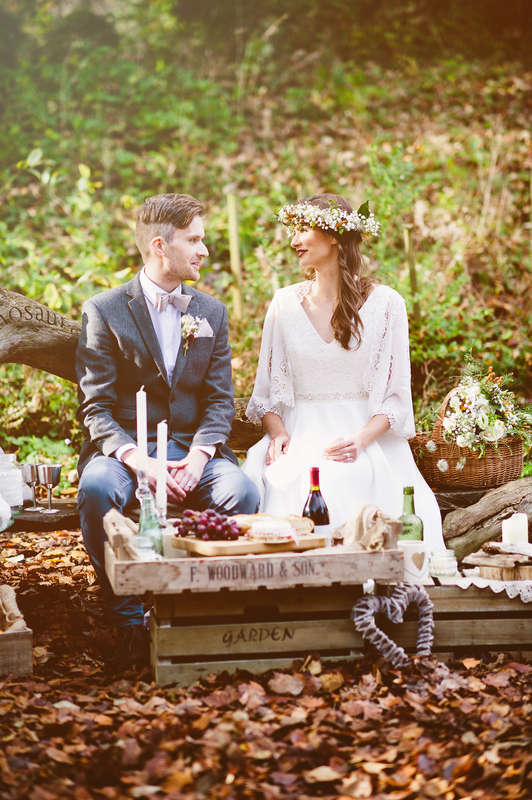 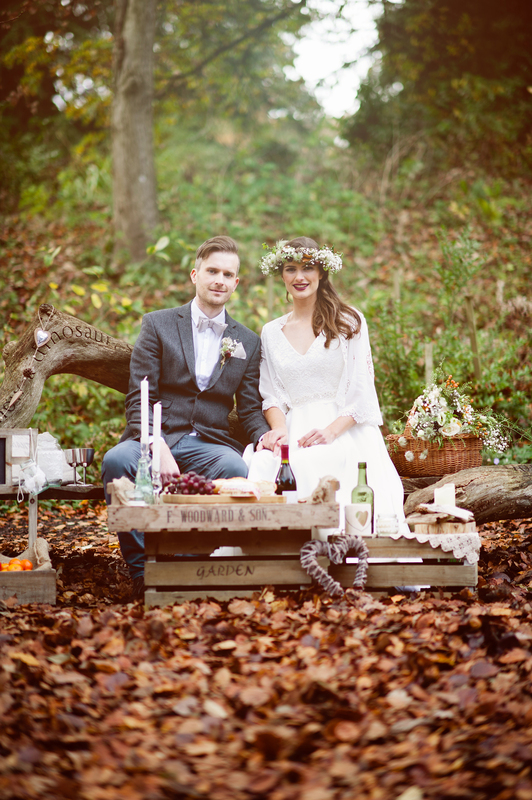 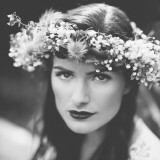 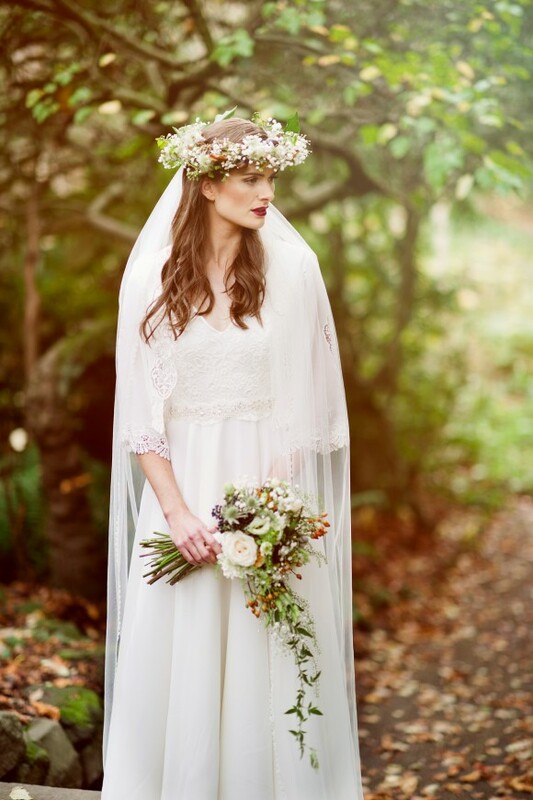 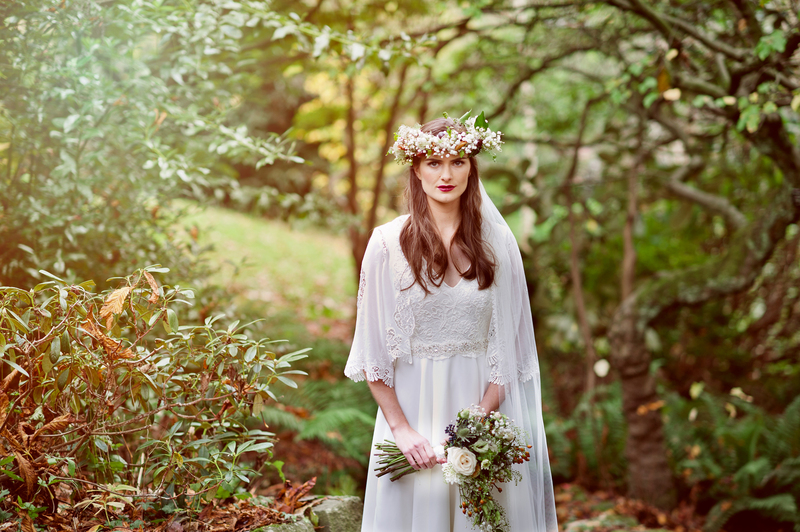 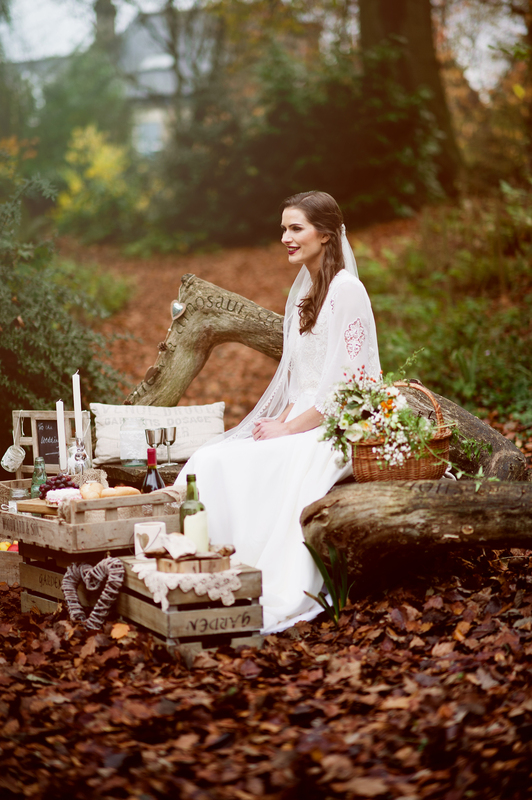 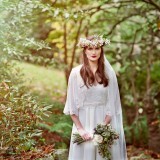 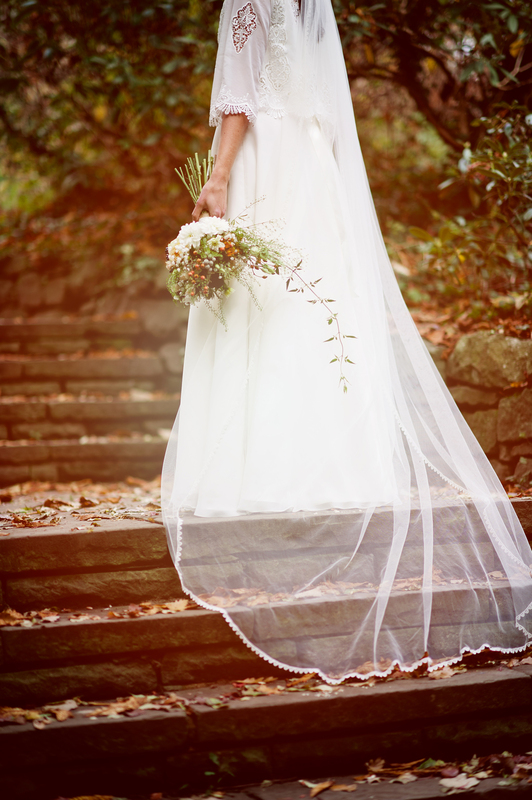 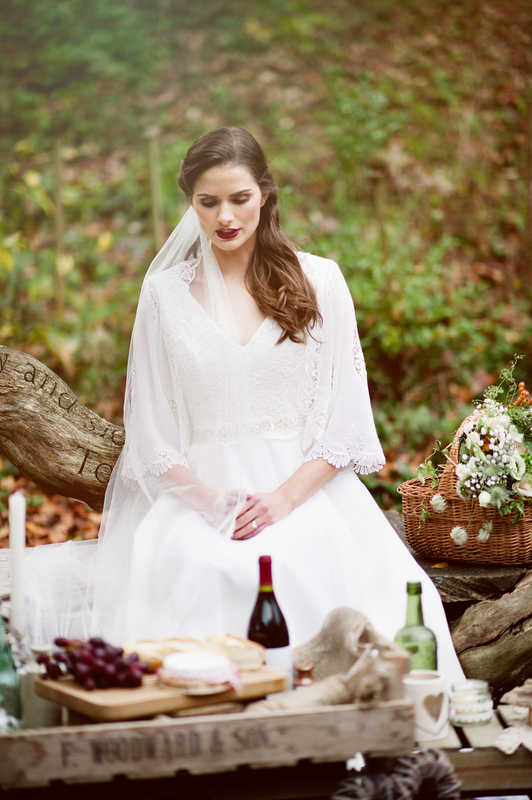 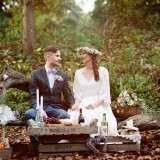 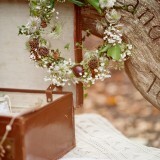 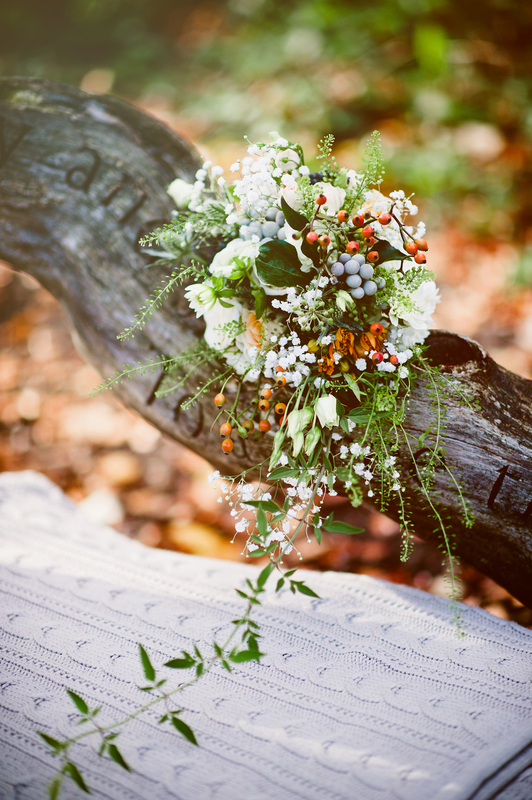 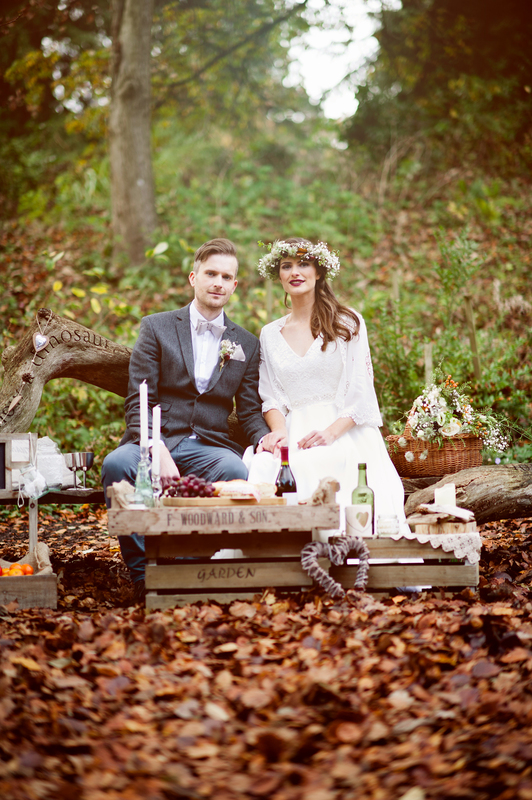 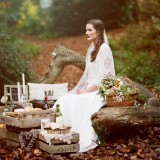 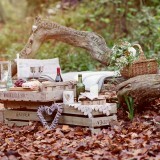 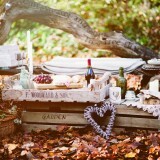 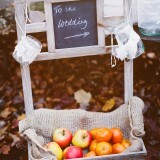 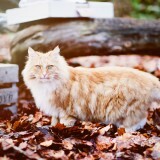 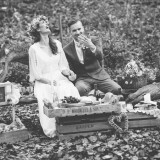 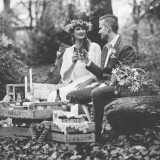 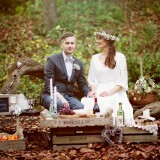 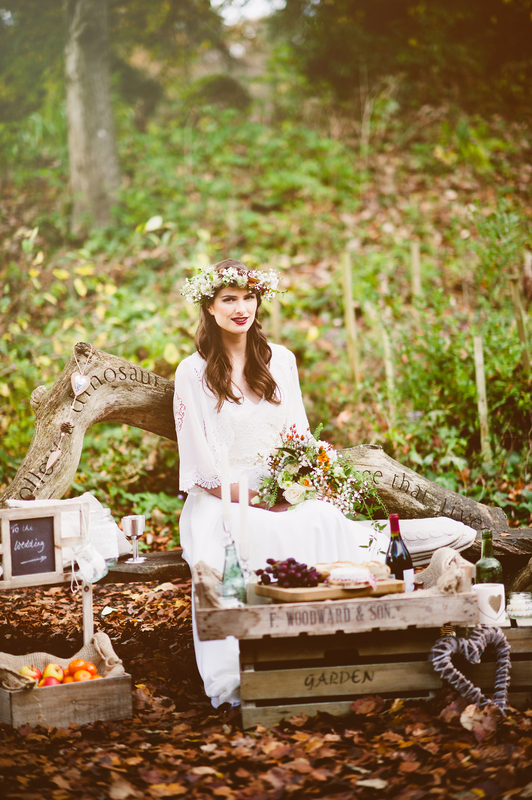 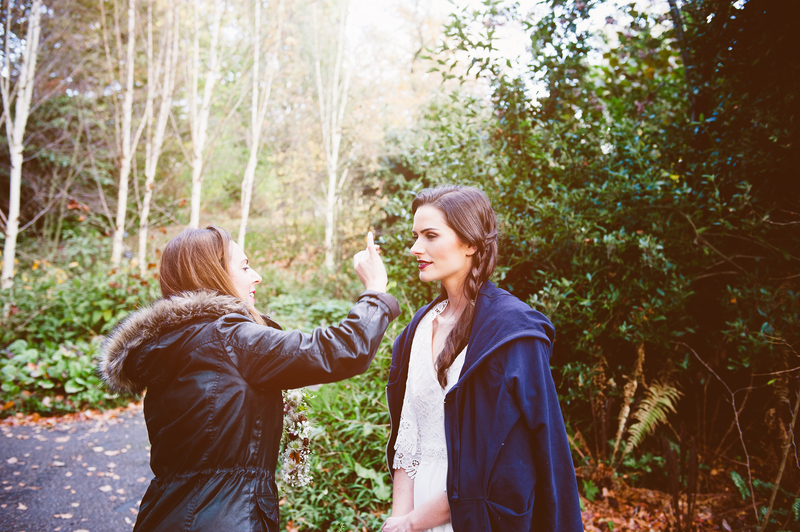 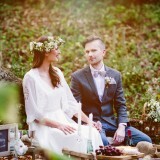 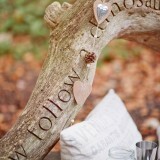 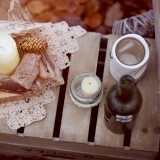 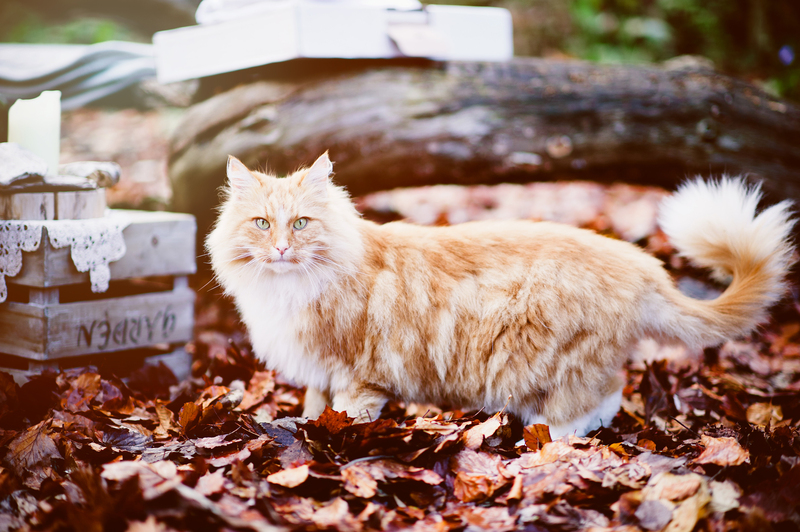 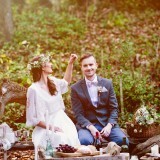 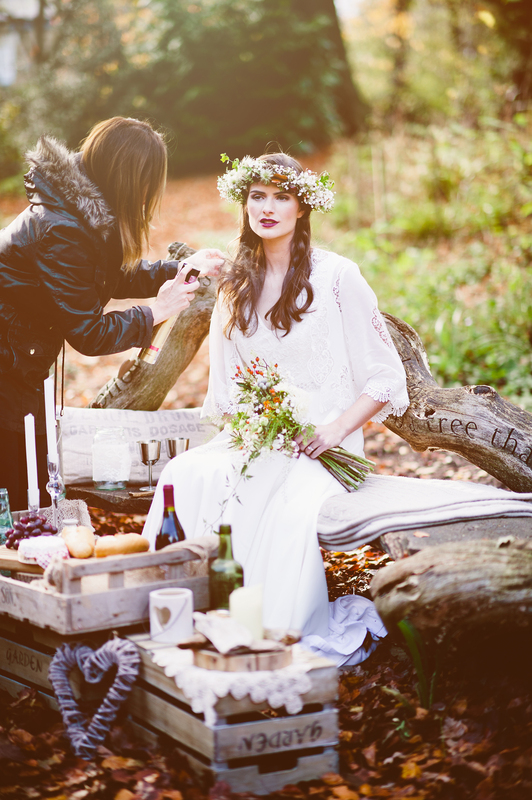 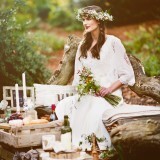 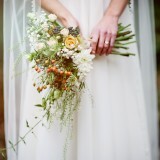 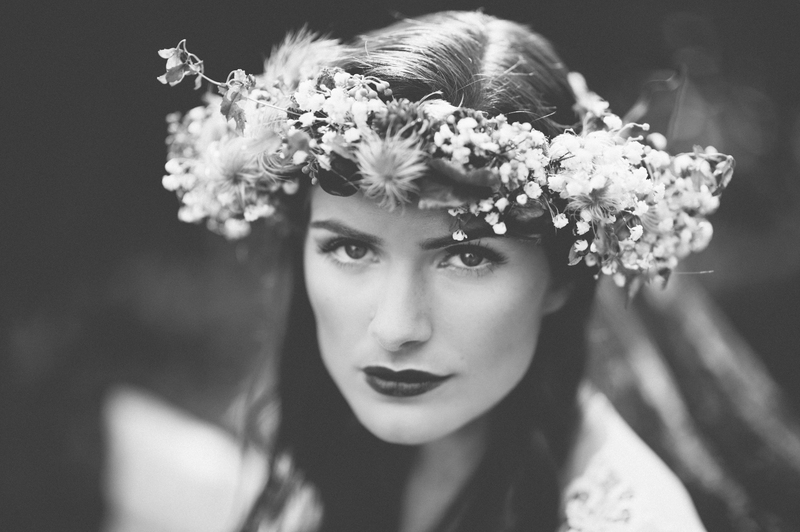 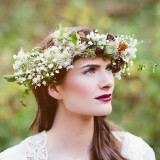 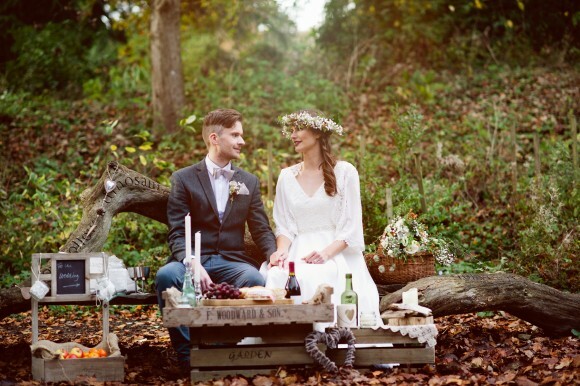 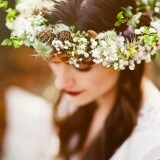 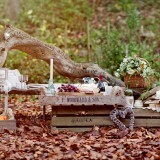 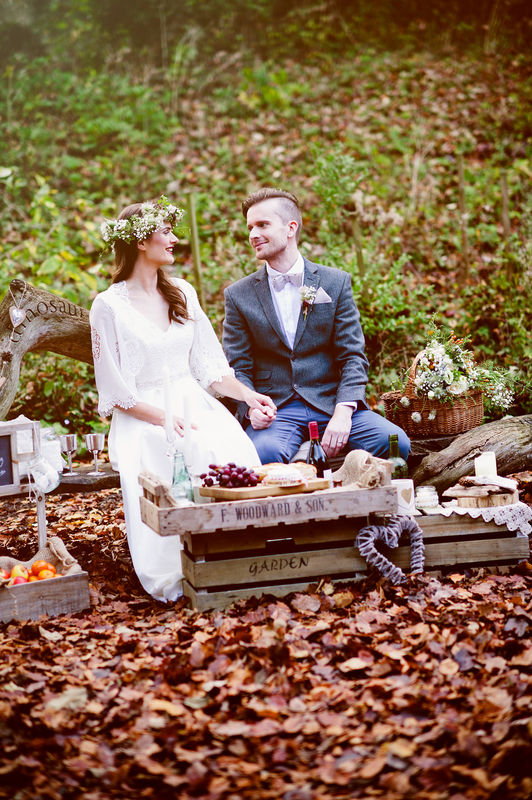 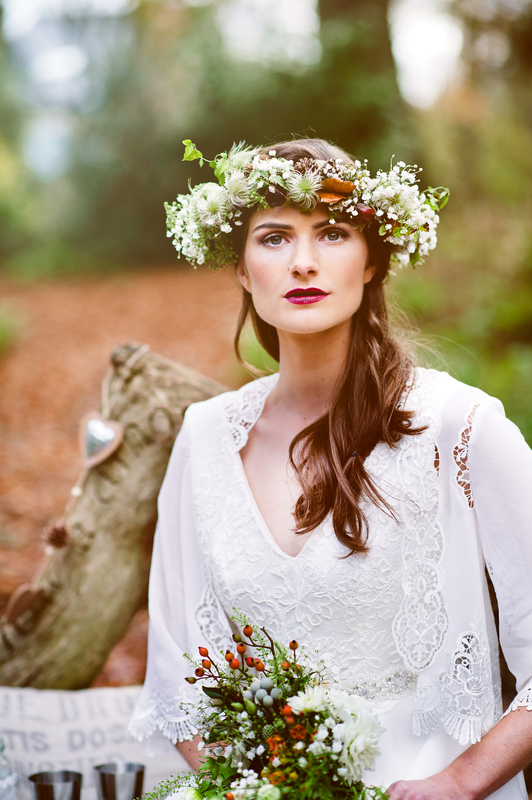 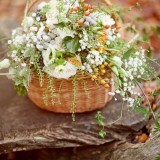 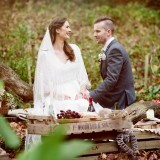 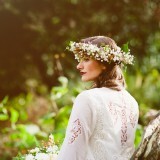 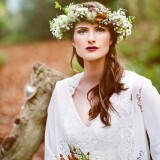 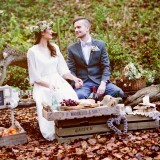 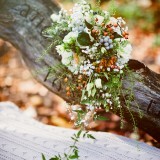 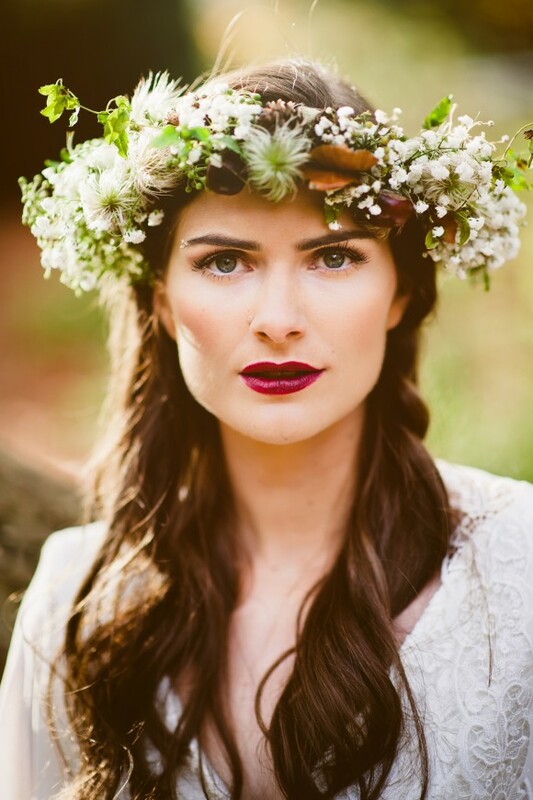 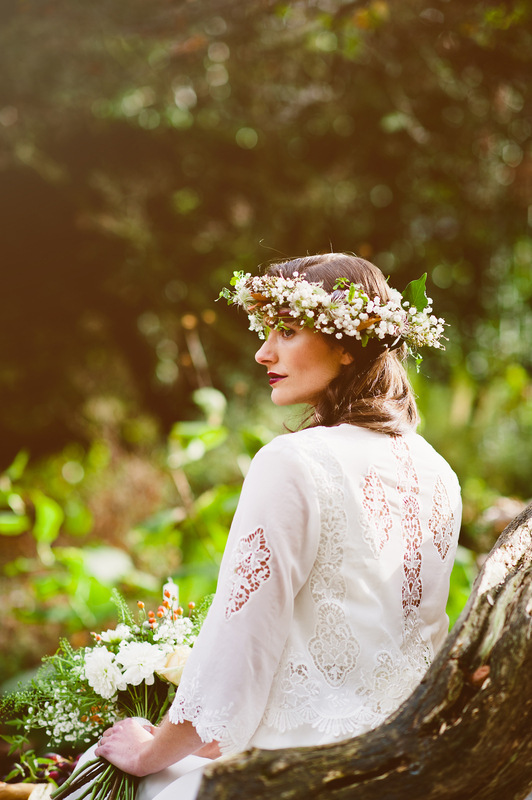 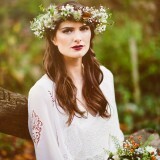 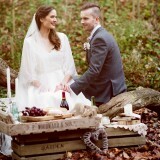 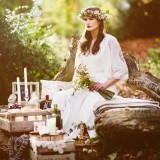 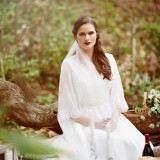 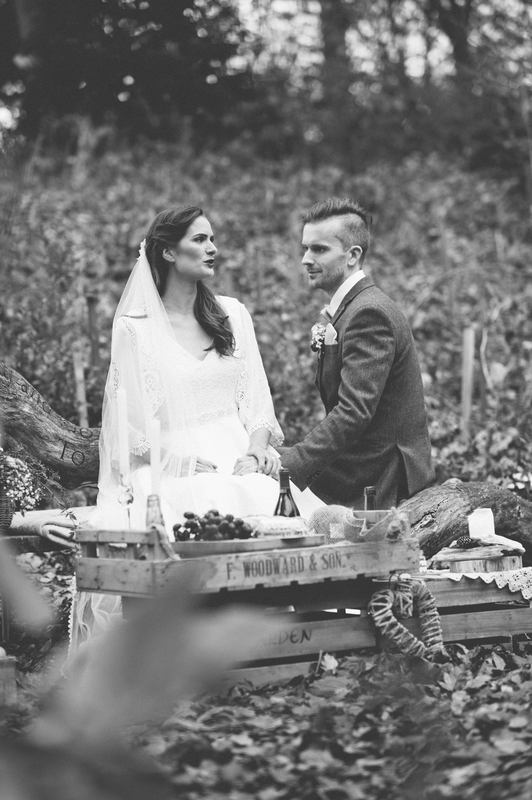 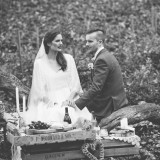 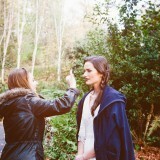 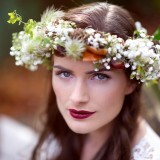 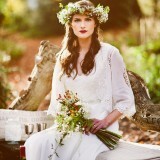 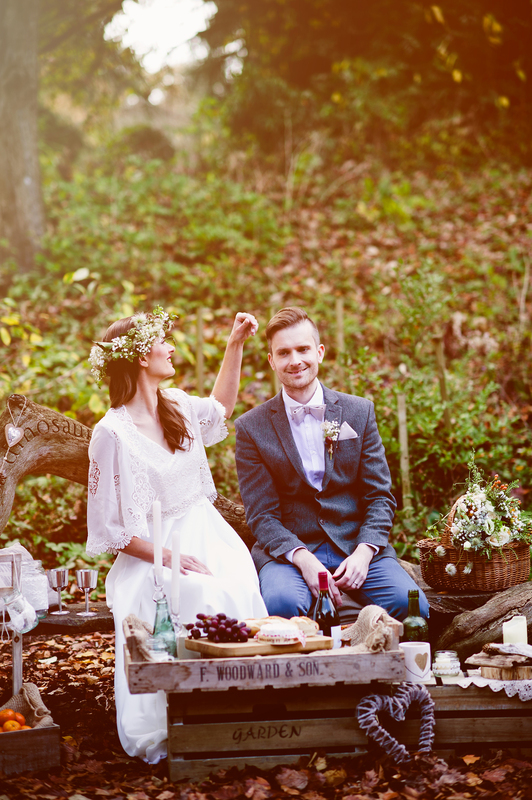 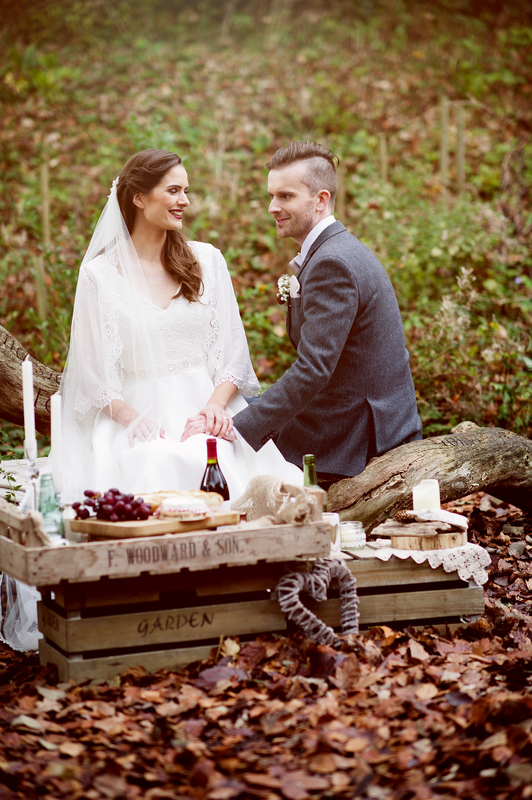 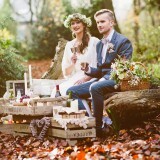 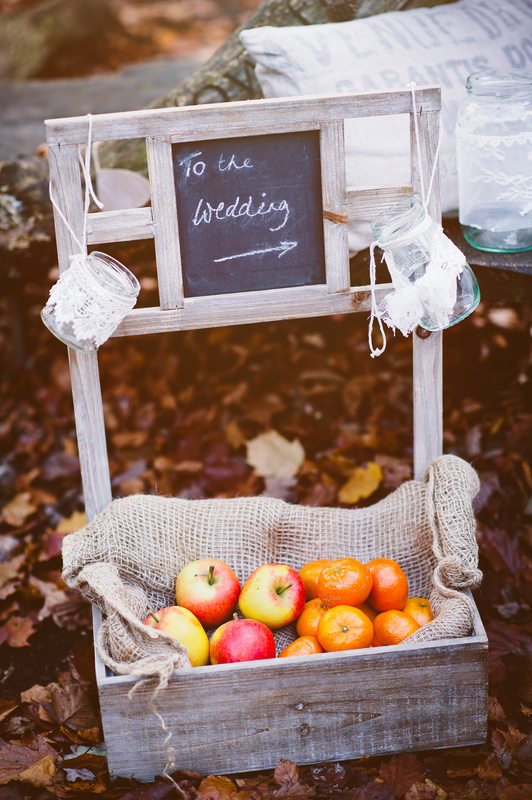 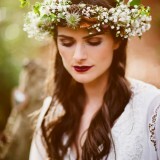 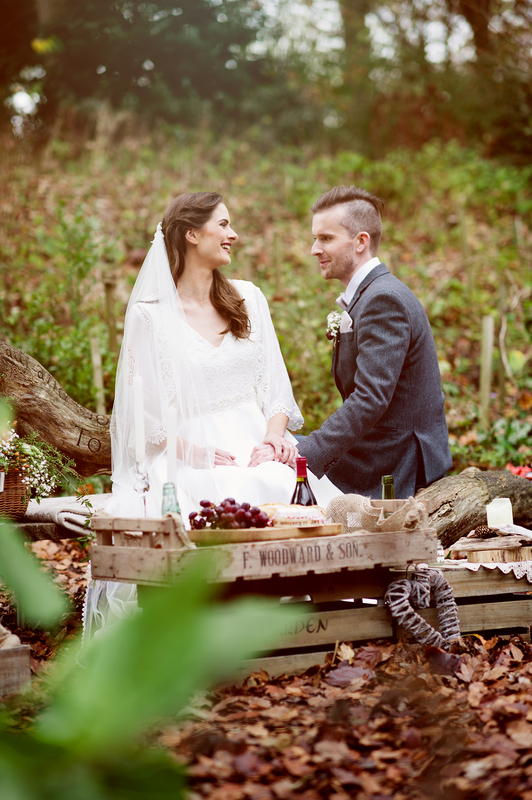 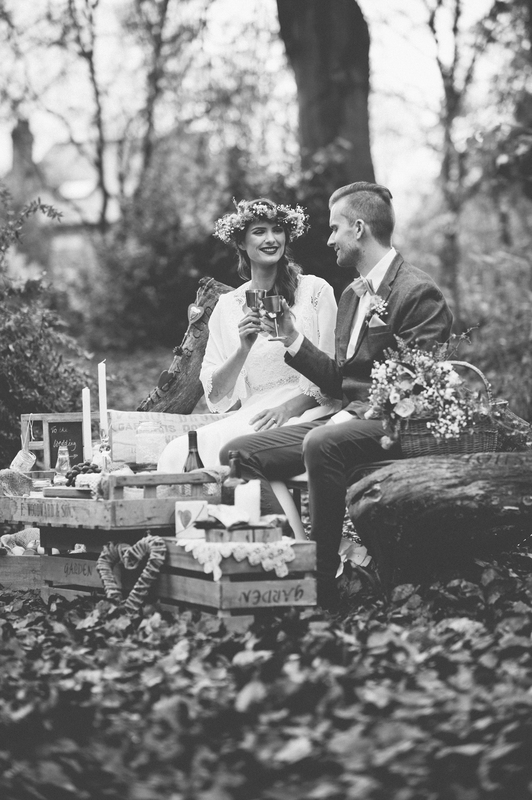 Hair and makeup inspiration for our shoot came from the rustic bohemian theme and autumnal colours. 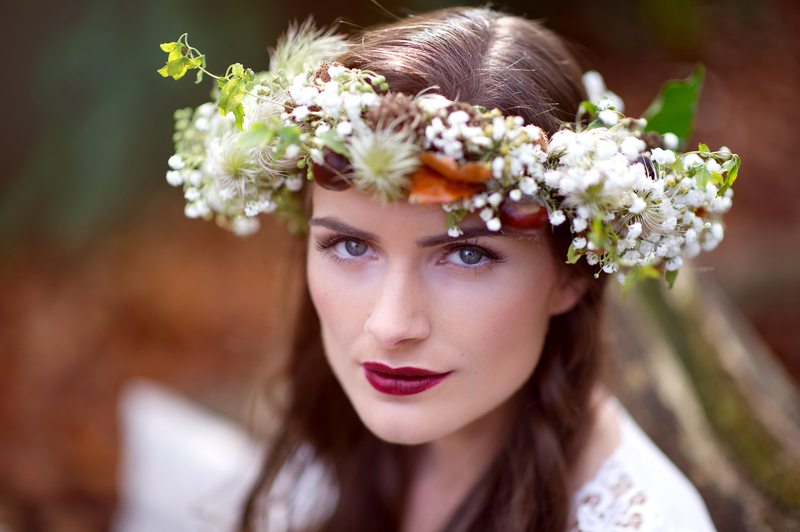 The makeup look was created by Sheffield based professional hair and makeup artist Julia Jeckell for our model, Hannah, with this in mind. 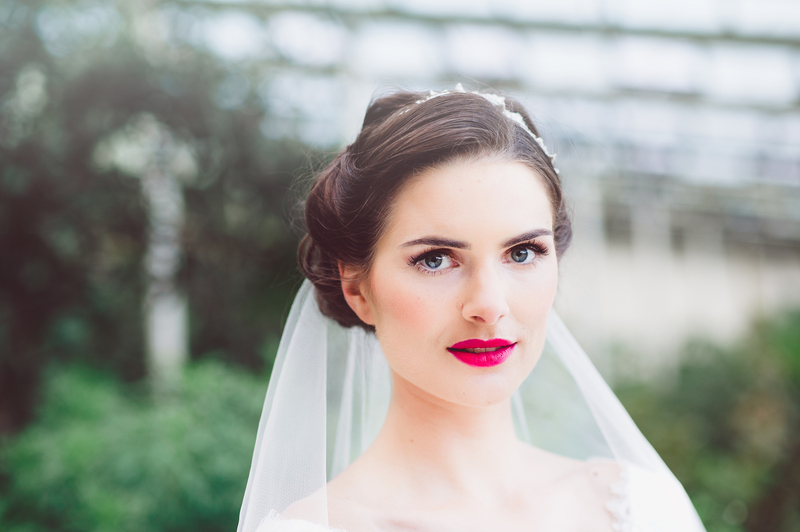 Initially, Julia applied the base using Airbase Airbrush makeup for a flawless finish and then light translucent powder to set. 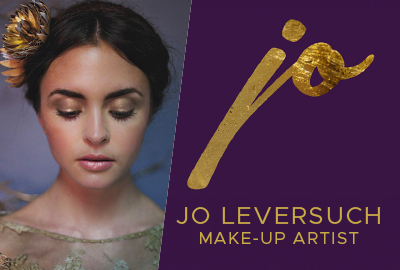 The eyes were then accentuated with a soft brown taupe shadow and individual lashes were applied for a natural look with a light sweep of black/brown mascara. 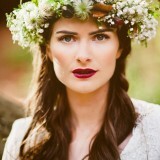 Hannah’s eyebrows were then defined using a brow powder in mid-brown. 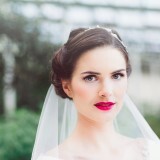 To finish, cheeks were warmed up with a sweep of tawny blusher and lips were painted a ‘mulled wine’ shade using a classic matt dark red lipstick. 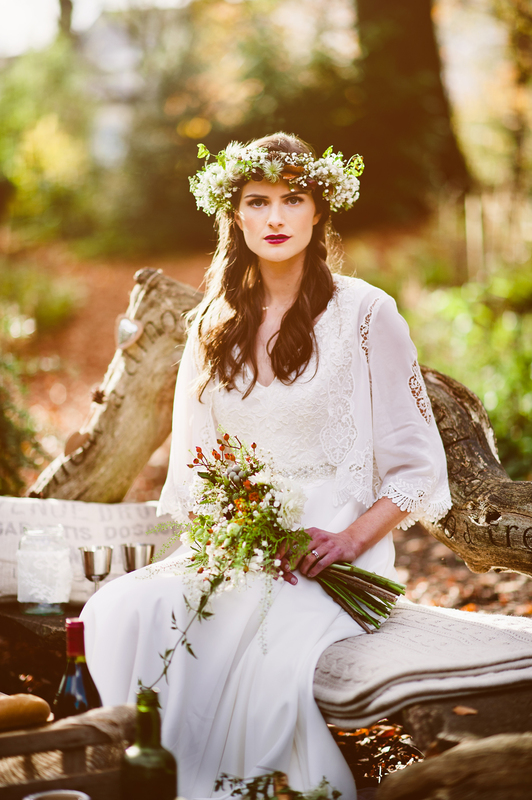 Hannah’s hair was centre parted and curled using a large barrel tong to create loose bohemian waves and finished with a small side plait to showcase the rustic open floral crown by Campbell’s Flowers. 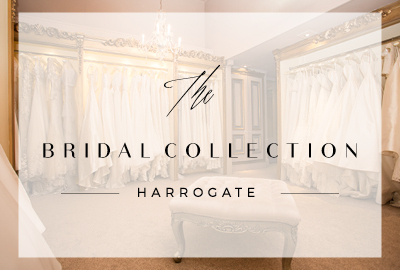 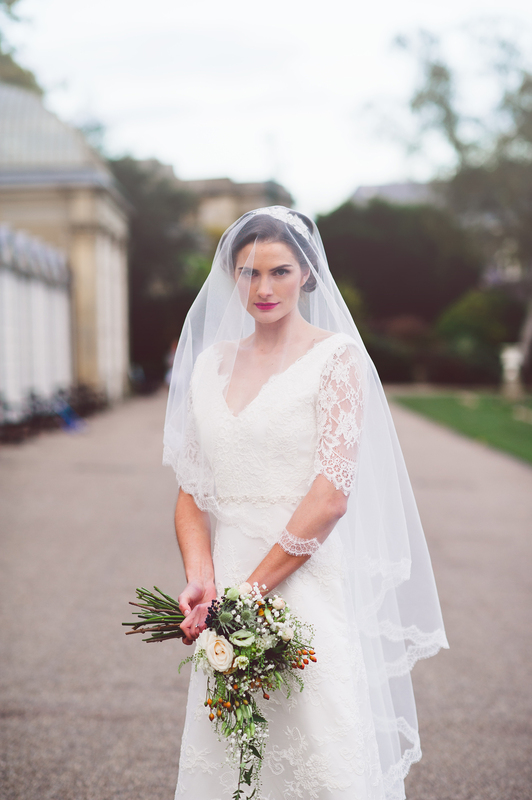 Further into the shoot, the hair and makeup was then adapted to a loose up-do for a more formal look to complement the classic style of the bridal dresses. 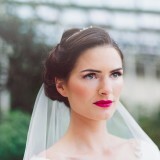 For this, Julia added a brighter matt lip in a vintage pink/red tone. 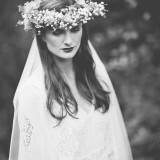 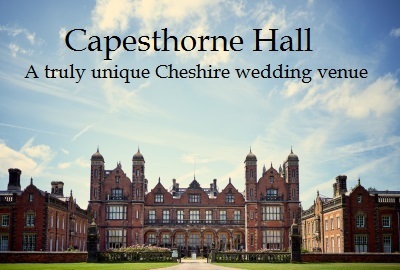 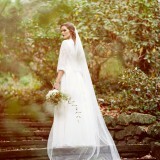 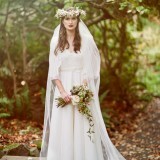 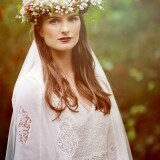 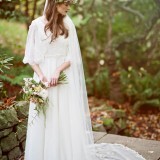 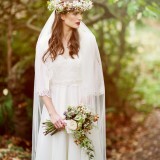 I supplied the dresses, veils and accessories for the shoot. 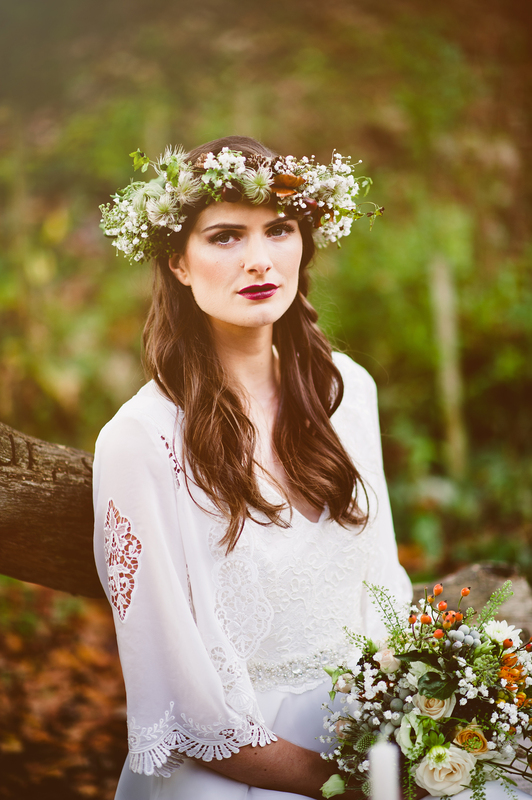 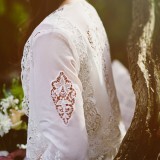 The Violet dress was perfect for the bohemian inspired look we wanted to achieve. 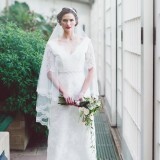 Violet is an ivory floor length circle skirt gown with a corded lace V neckline bodice. 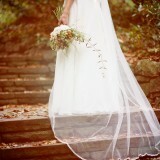 The full skirt is made of two layers of ivory duchess satin and chiffon with scallop lace edge detailing on the waist. 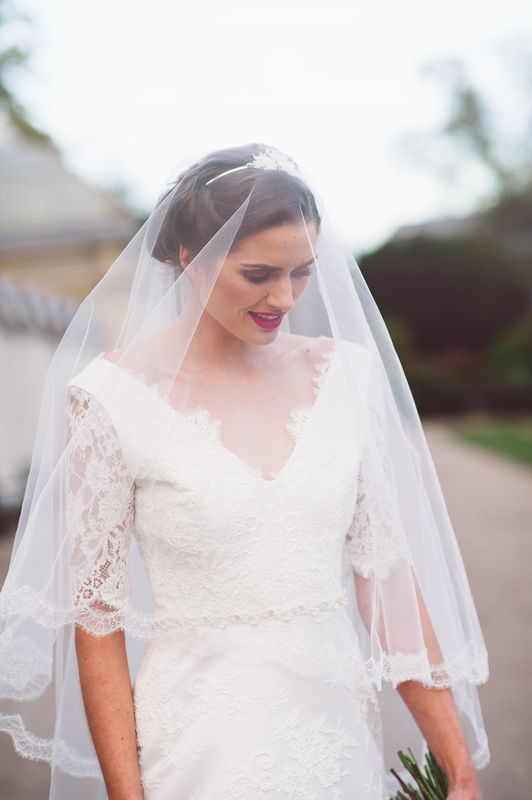 We styled Violet with one of our bridal belts and the Viola jacket which is a perfect cover up for brides-to-be on their wedding day. 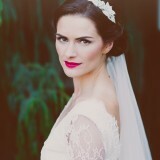 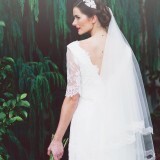 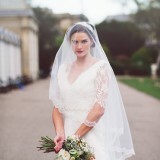 To showcase a different look, we also styled the Violet dress with Aurora chapel length lace edge veil. 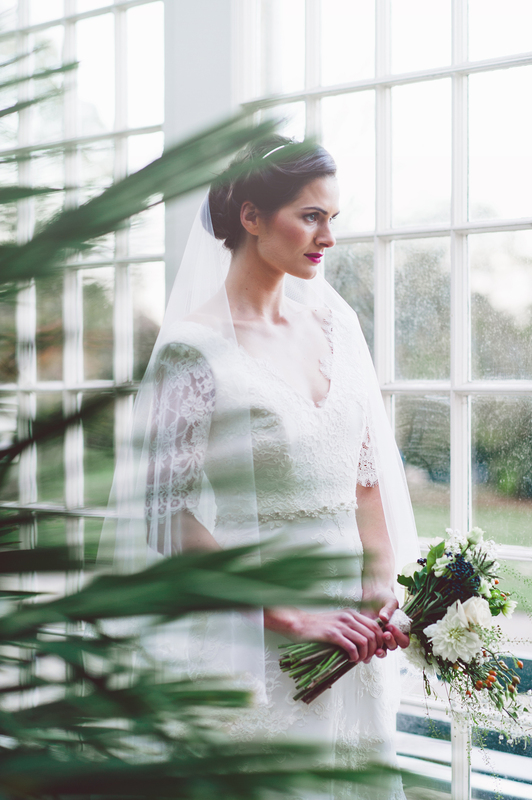 For the second look we chose the Pamela’ dress which worked beautifully in the conservatories. 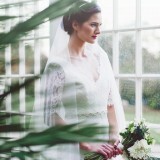 Pamela is an ivory floor length lace gown with three quarter length lace sleeves. 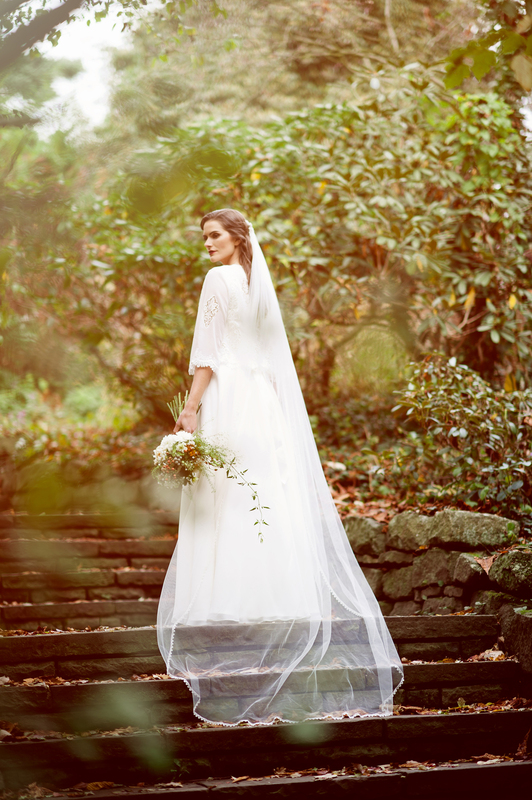 It has a deep V neckline at the front and back of the gown with scallop lace edge detailing on the neckline, sleeves and hem. 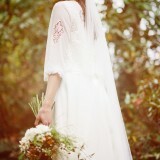 The gown is fastened with pearl buttons down the back. 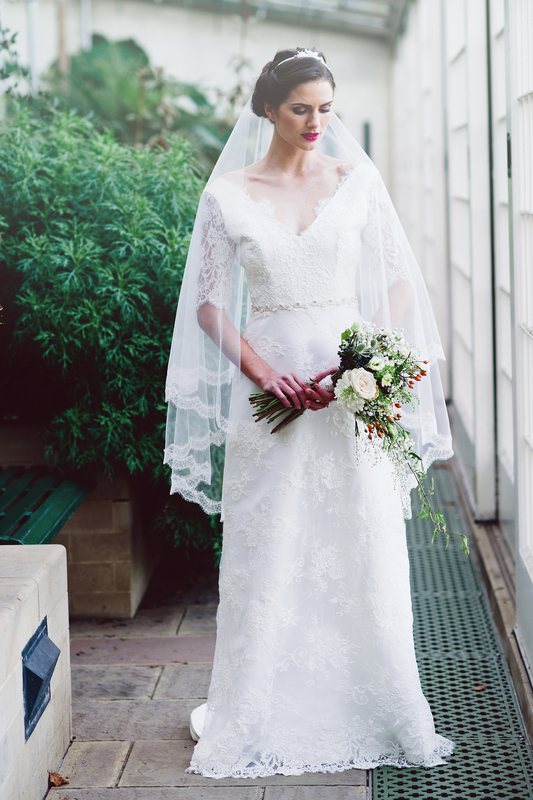 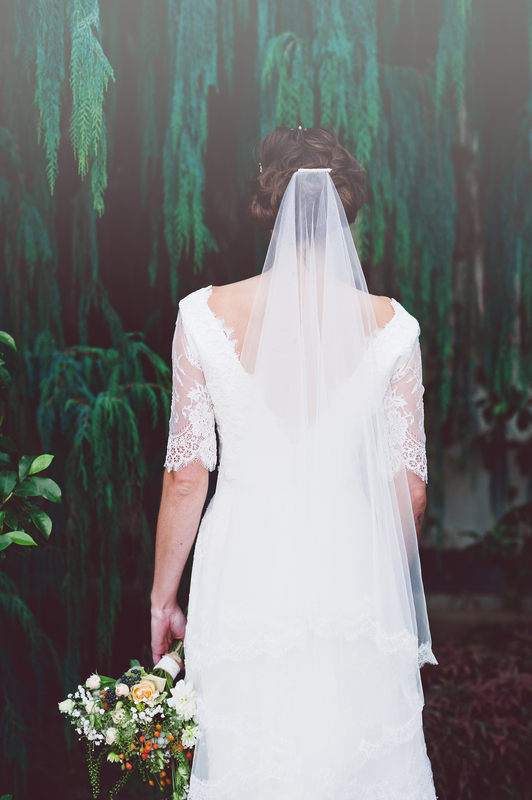 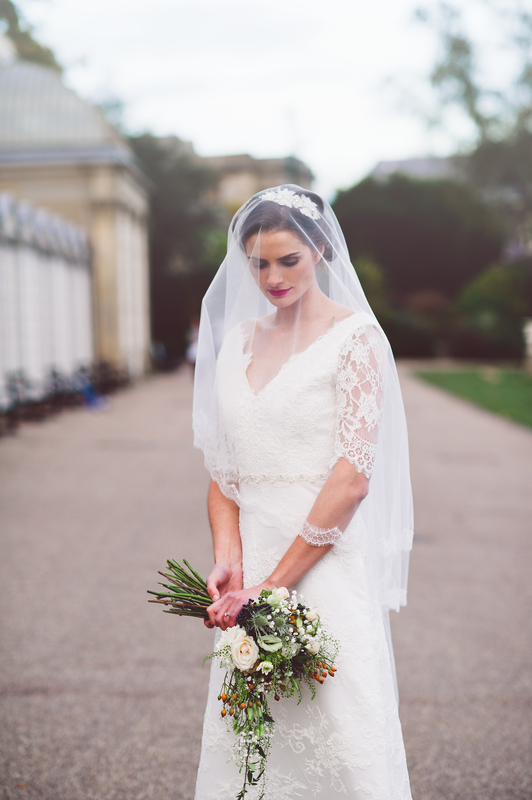 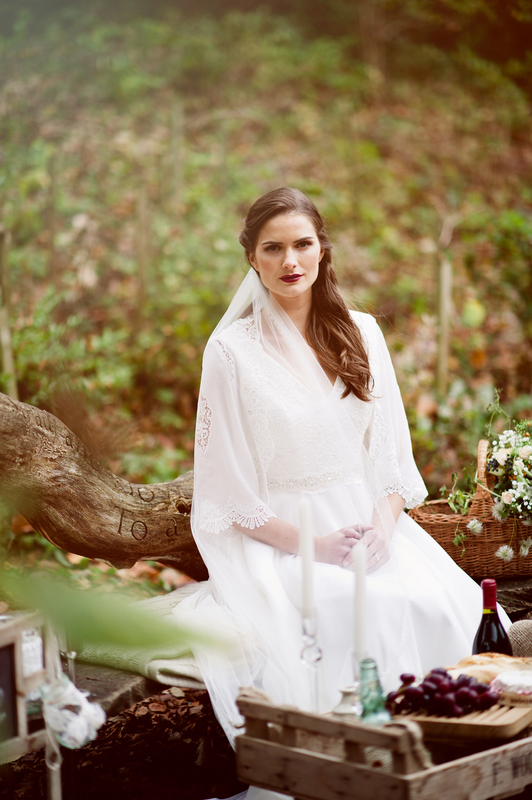 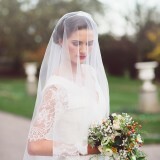 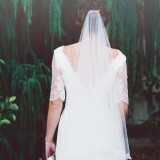 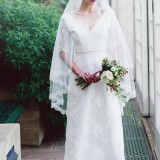 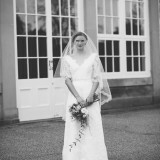 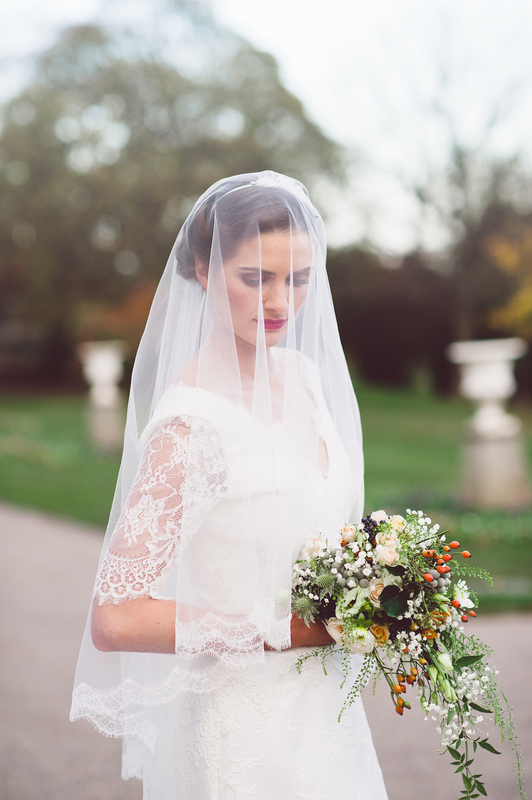 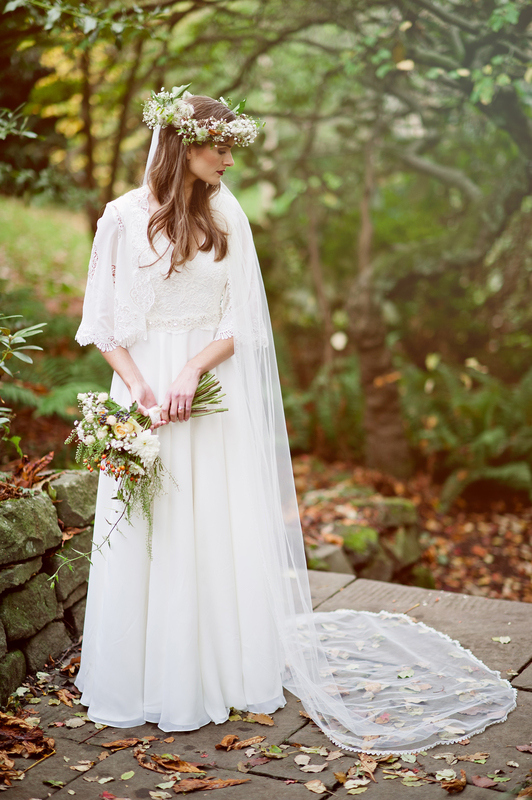 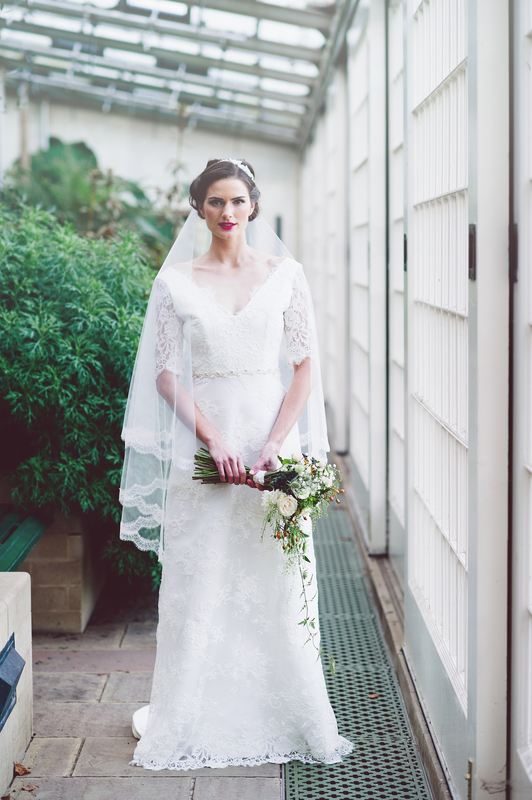 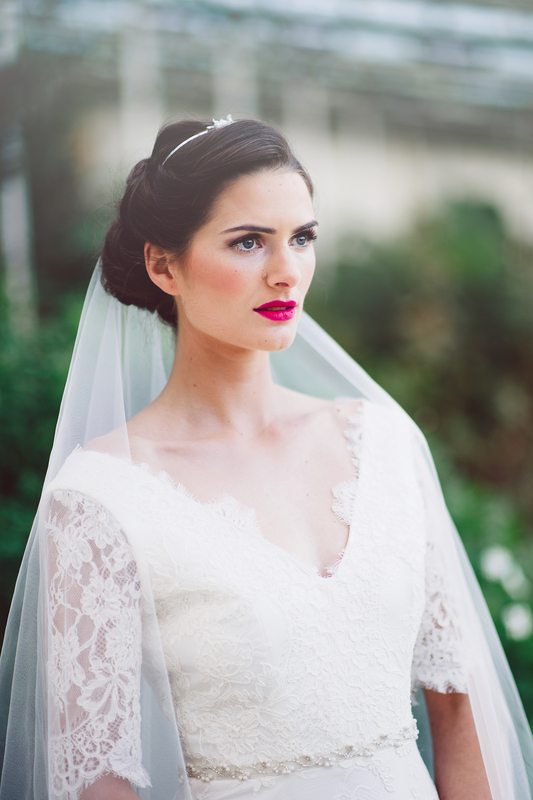 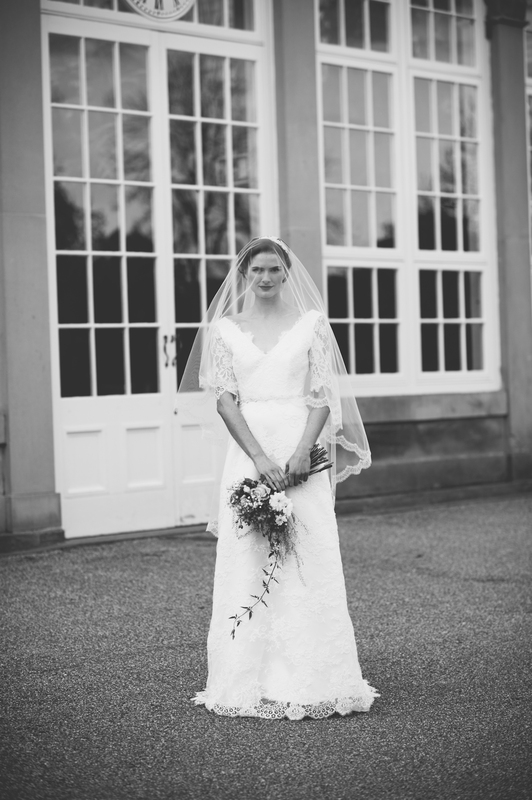 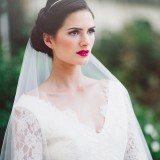 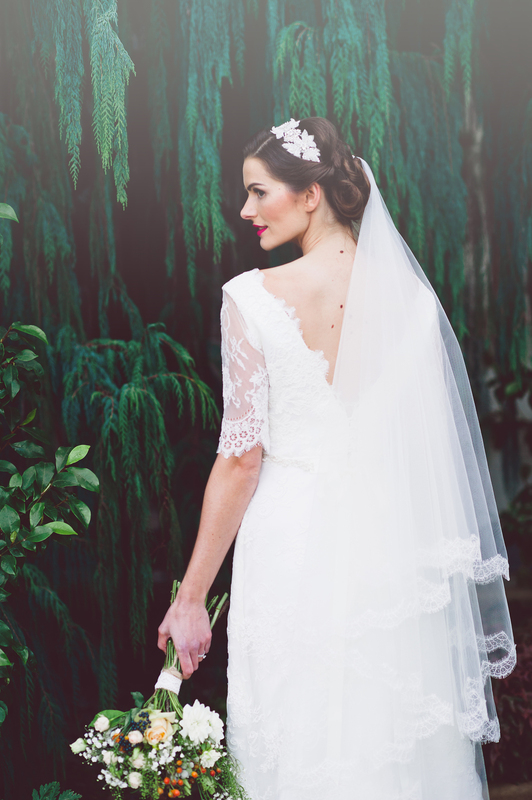 We styled Pamela with the Kate veil, which is a beautiful drop veil edged with a delicate ivory Chantilly lace trim. 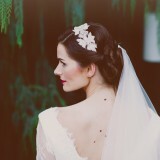 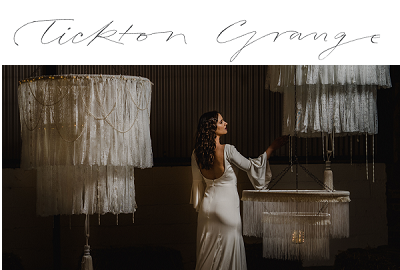 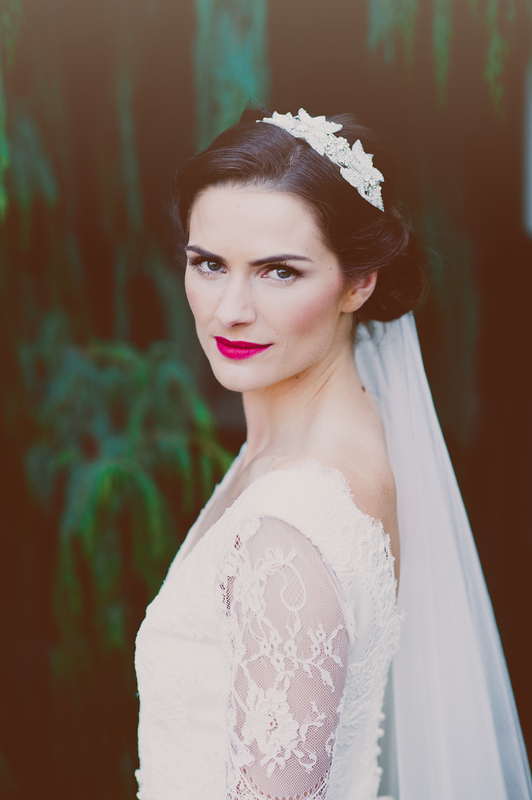 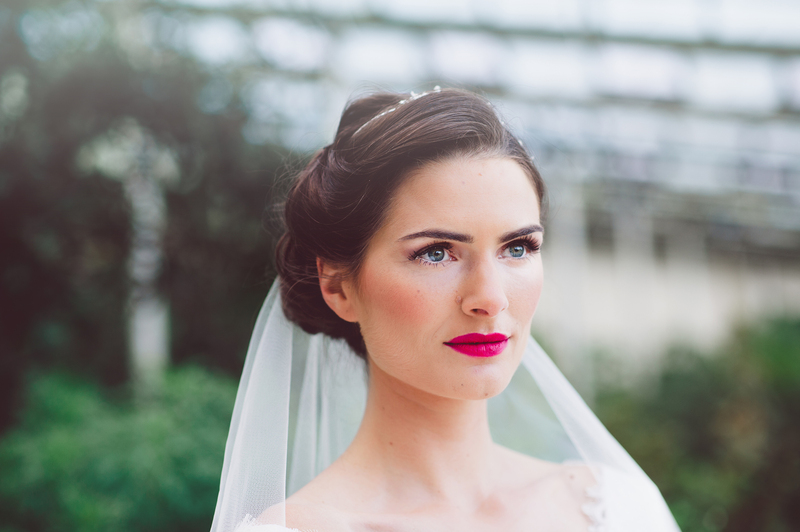 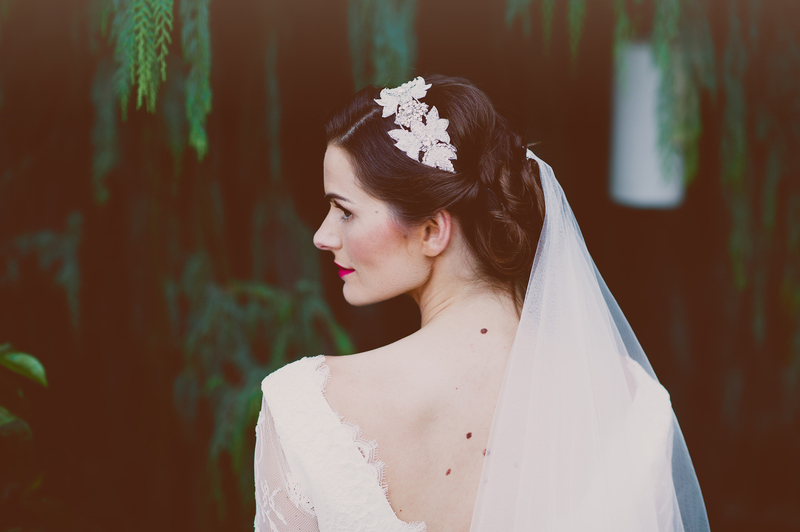 We finished the look with our crystal Eleanor headpiece – it caught the natural light in conservatories beautifully. 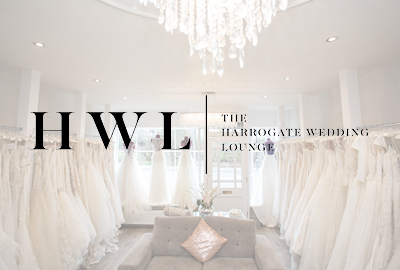 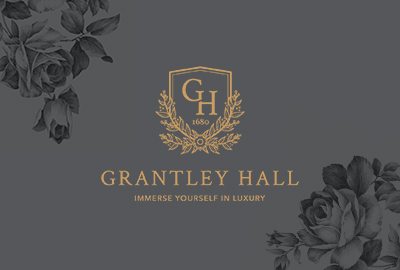 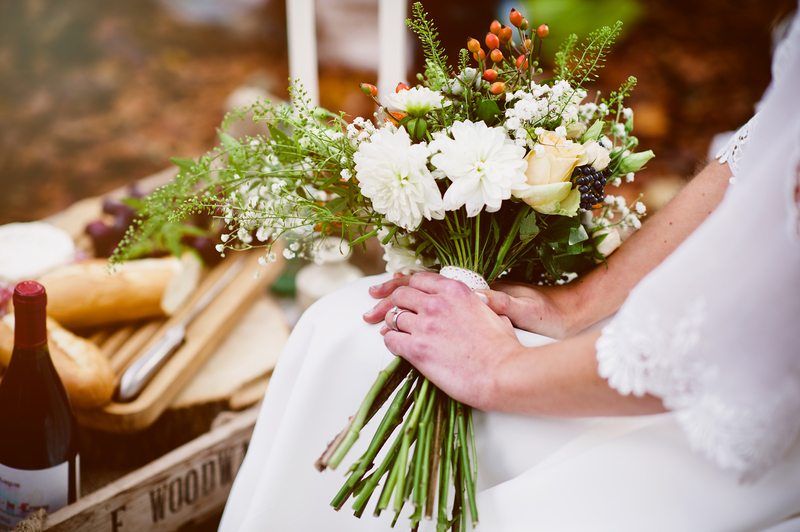 Tracey of Campbell’s Flowers adores working seasonally and so jumped at the chance to get involved in the shoot, showcasing some materials which she believes might not always get the limelight they deserve. 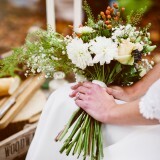 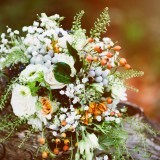 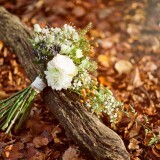 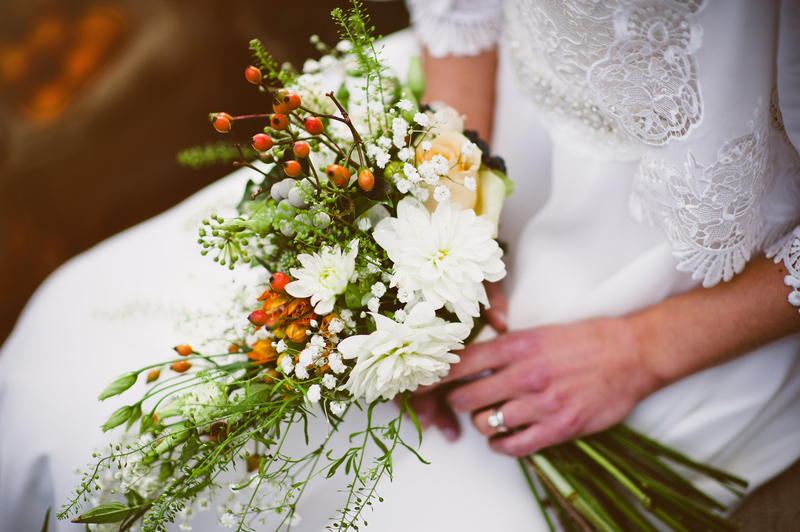 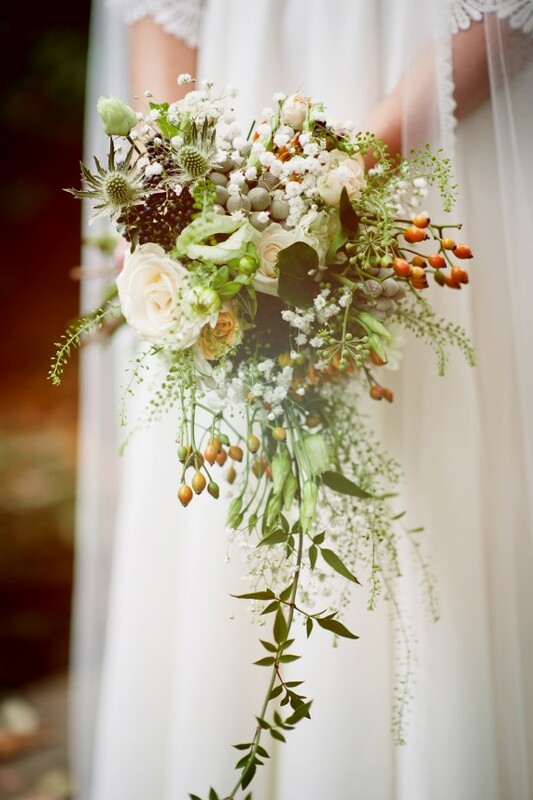 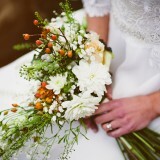 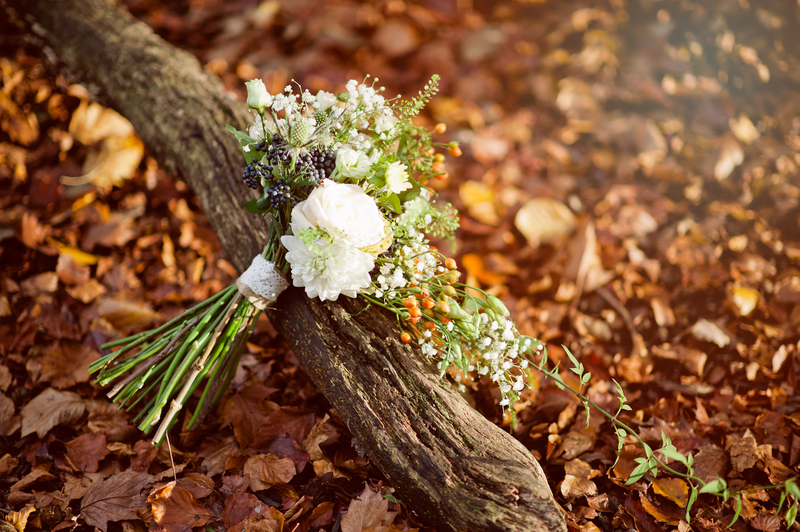 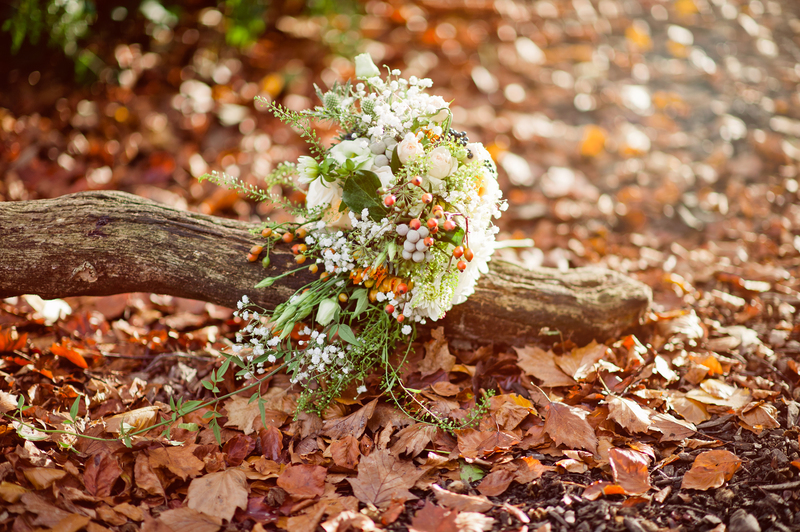 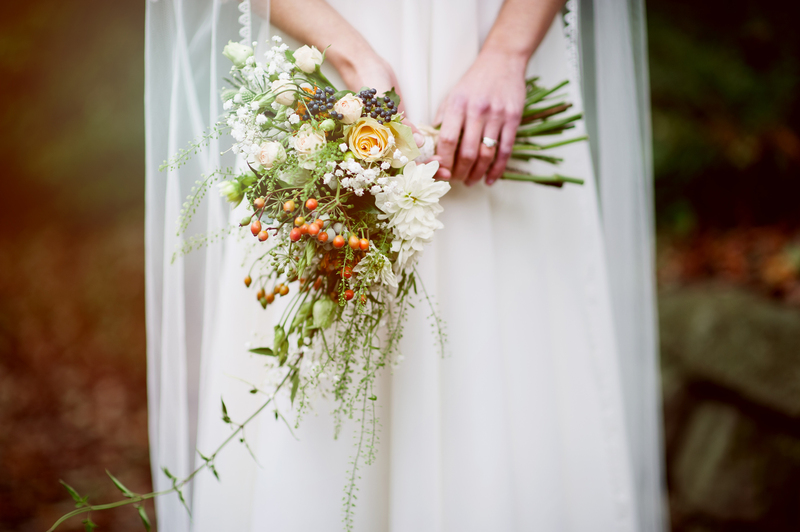 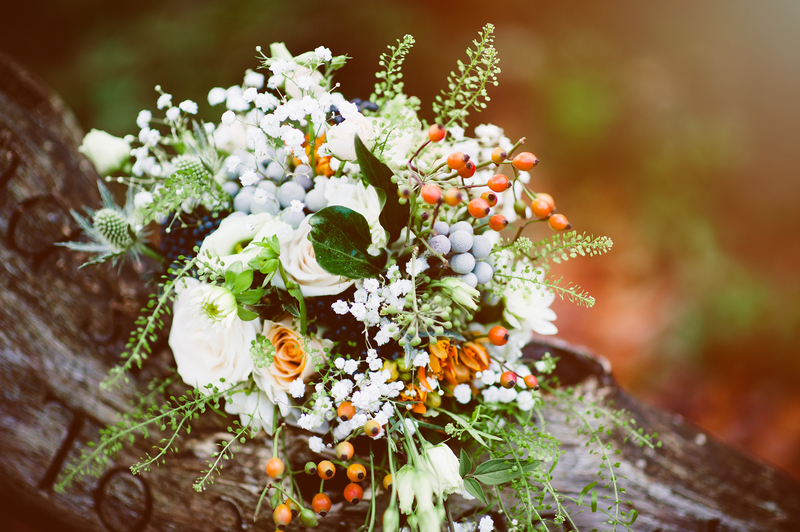 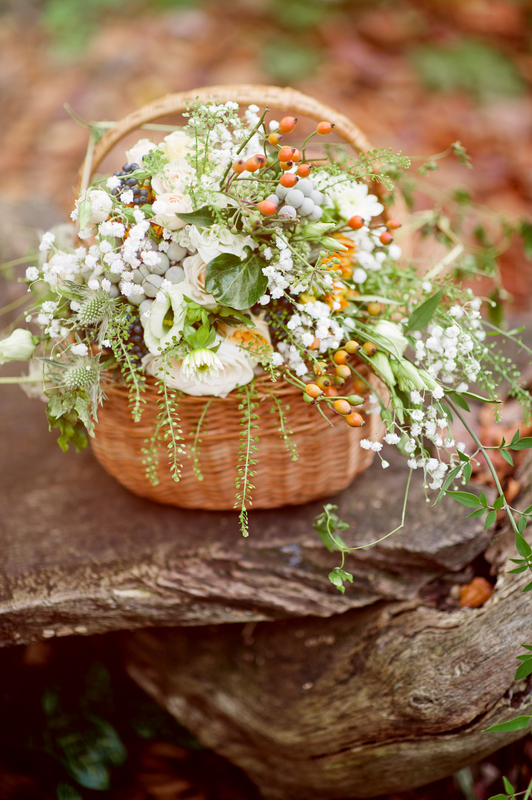 Using a really rich autumnal colour palette, Tracey created a very soft, delicate bouquet in whites, creams and greens with accents of earthy browns and rich burnt oranges. 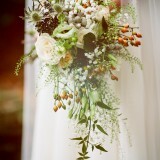 Soft grey brunia berries intermingle with wispy, delicate thalaspi foliage, sweet scented autumn roses, green lisianthus, white thistles along with seasonal rosehips for texture. 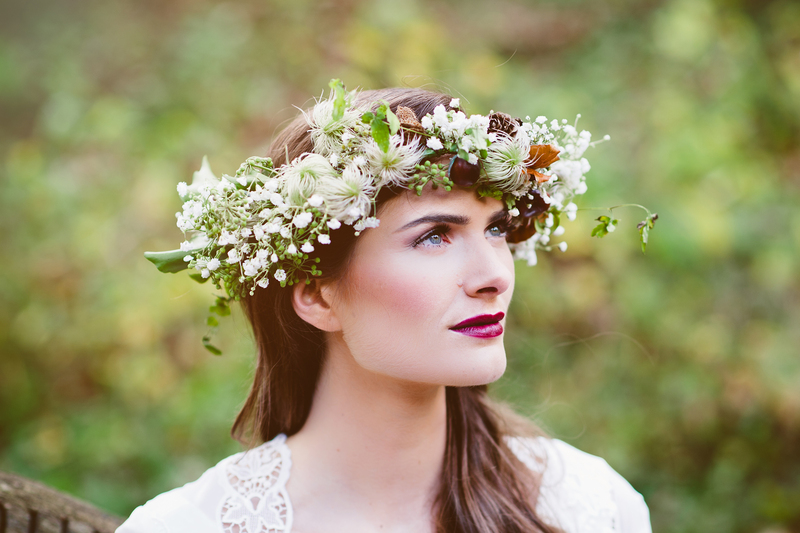 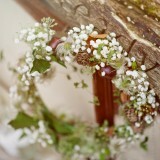 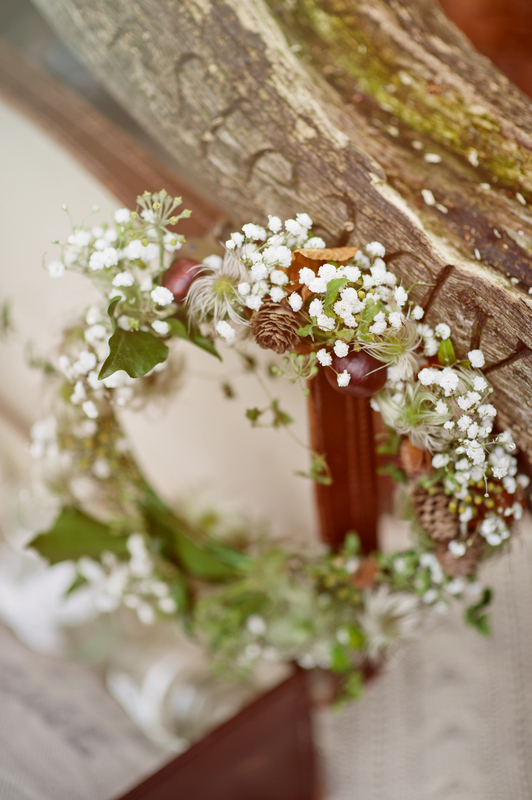 In keeping with the woodland, wil ‘o’ the wisp feel to the shoot, Tracey also created a really soft and open floral crown using white thistles, white gypsophila, silvery clematis seed pods, birch cones, beech leaves and, the literal jewel in the crown, shiny conkers. 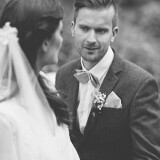 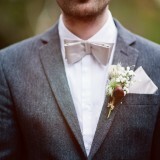 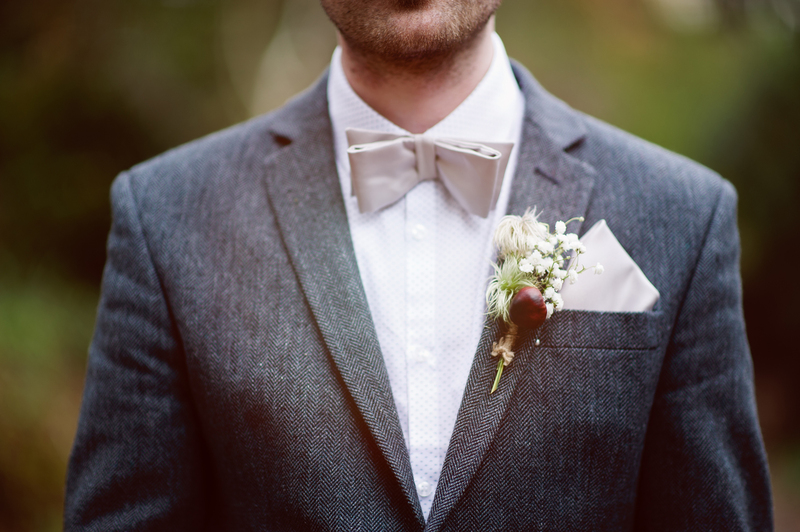 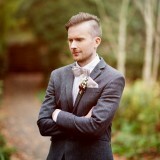 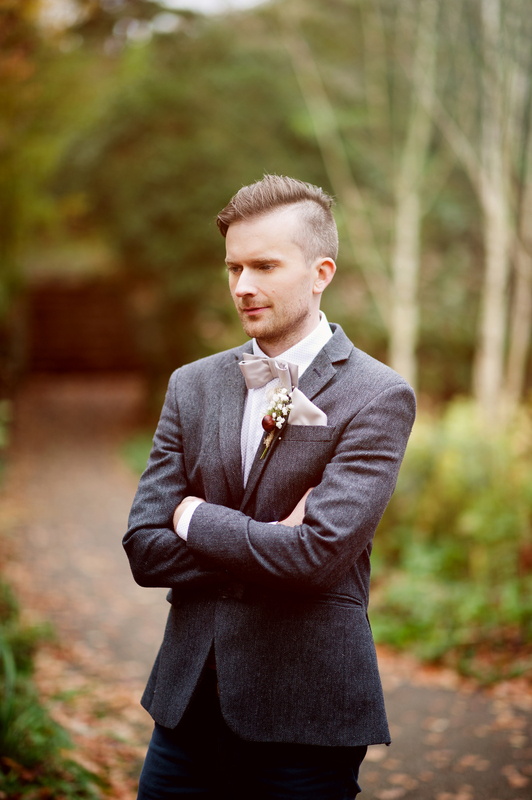 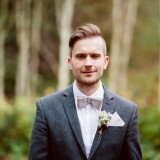 Finally, Tracey created a conker buttonhole for our male model Tom. 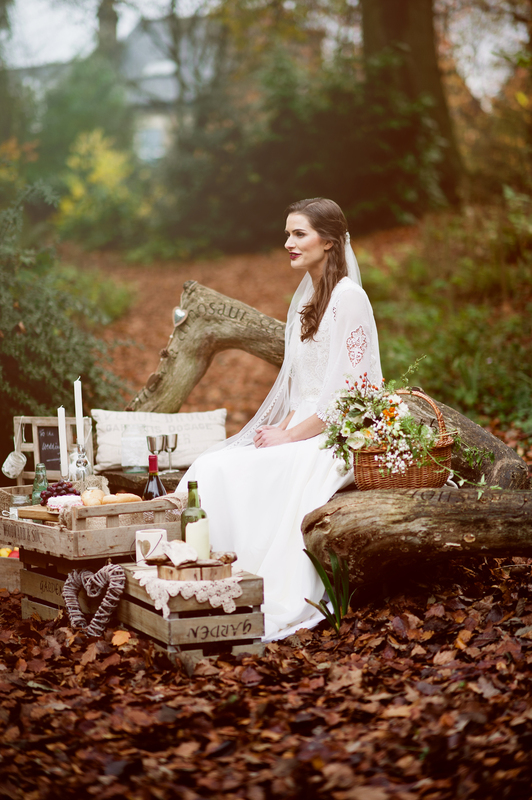 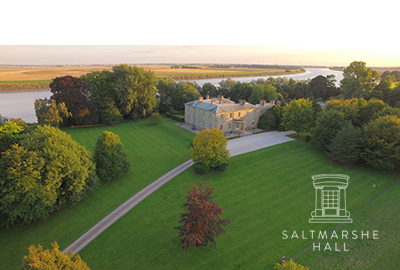 Overall shooting was a little challenging as it was cold outside and the days have become shorter so we had to compete with both the weather and fading light to get those final ‘perfect’ shots, with which we are thrilled! 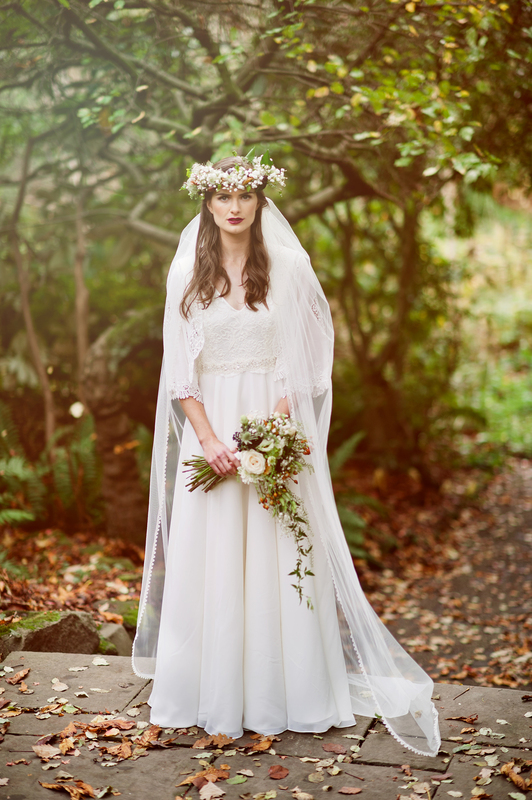 Following the success of this shoot, the team are now planning to collaborate on another shoot this autumn showcasing some of my new collection which will be launching next year.